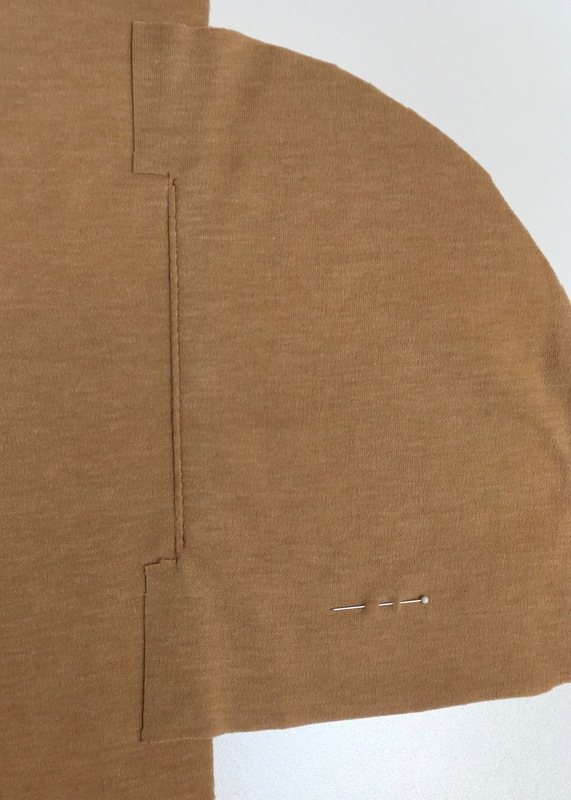 The Rosita Jacket provides for multiple seam finish options. 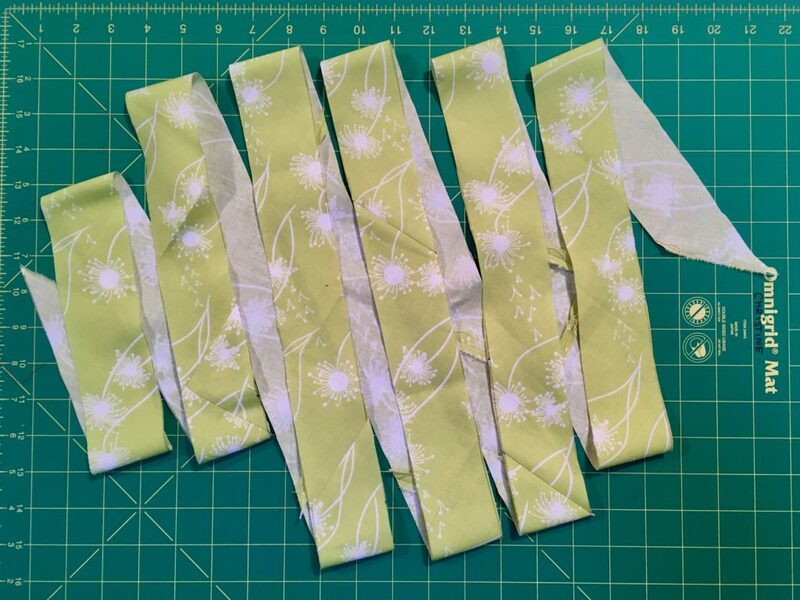 Binding them with a custom made bias tape is one of many very nice ways to make a statement with this pattern. 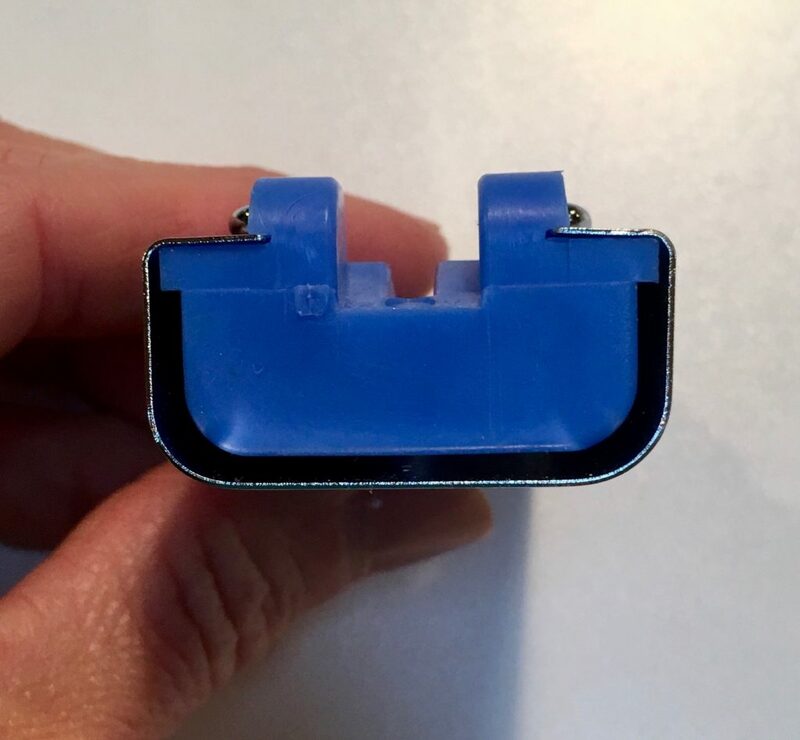 When considering bias tape as an option, we’d like to encourage you not to settle for the standard package varieties. For a truly designer jacket, consider making your own instead. 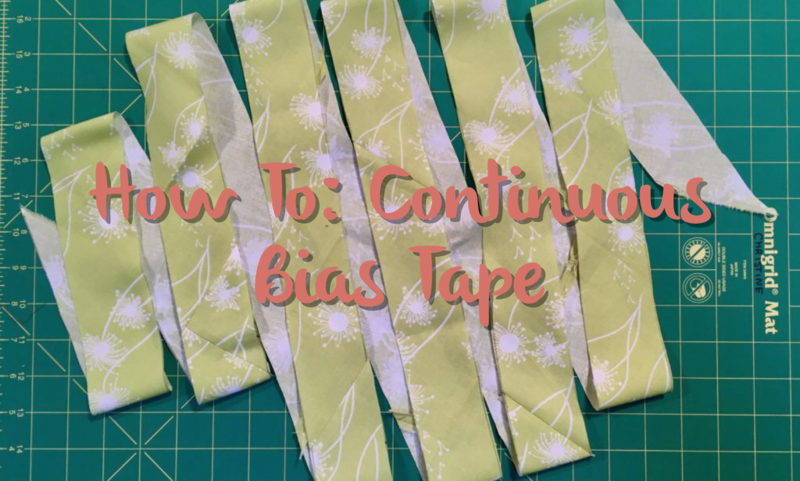 The continuous bias tape making method is easy and worth the effort. Full disclosure, we didn’t invent this technique and if you search for it online, you will find many resources telling you how it’s done. We reviewed several online references before creating our own tutorial. I like to place my see through ruler so that the 1st line is positioned just inside the 2” line. Doing this accounts for the thickness of my marker ensuring an exact 2” line. 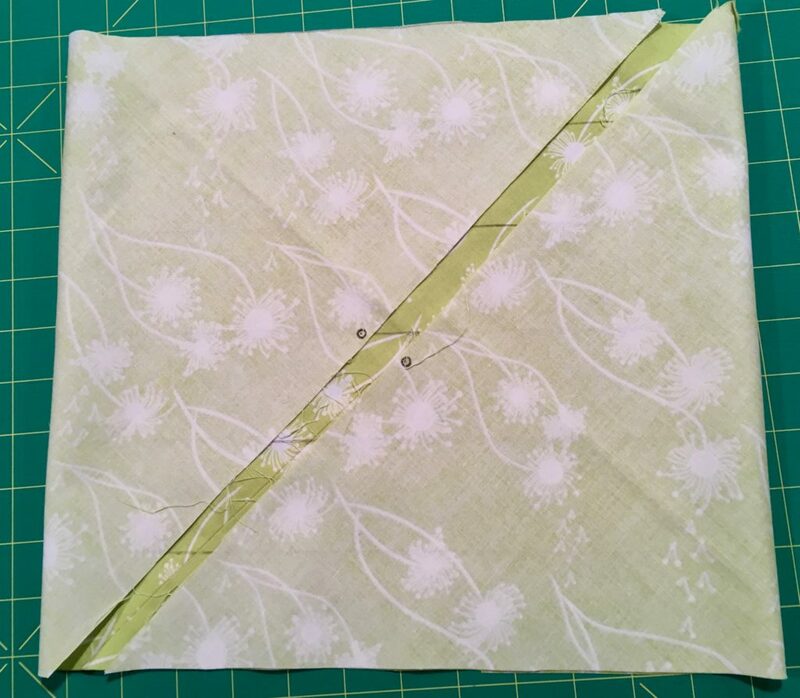 Now, with your fabric still right side up, fold the two short ends in towards the center. keep the short sides even so that the drawn lines line up. Now, offset the lines by one line. Keeping the offset in place, pin the short ends together. 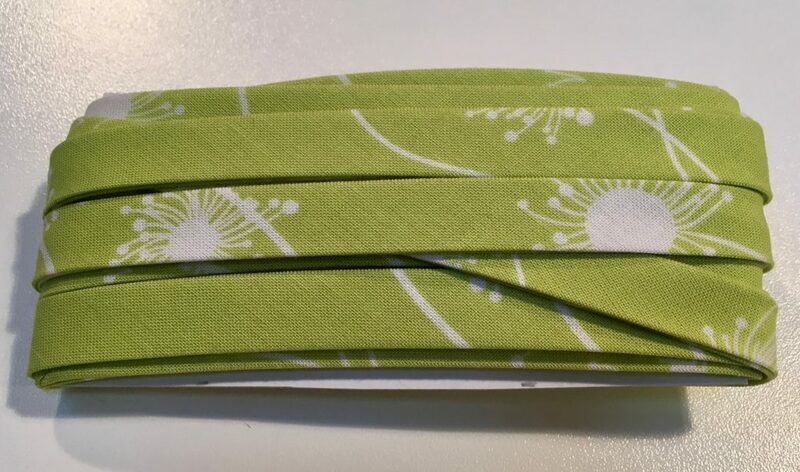 Beginning at one of the single folded ends, fold the tape in half again and press the entire length. Now you have your one of a kind designer bias tape for your Rosita Jacket. 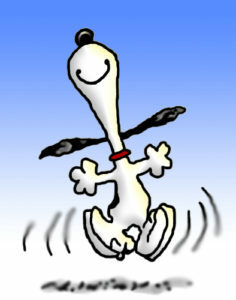 Time for a happy dance!!! 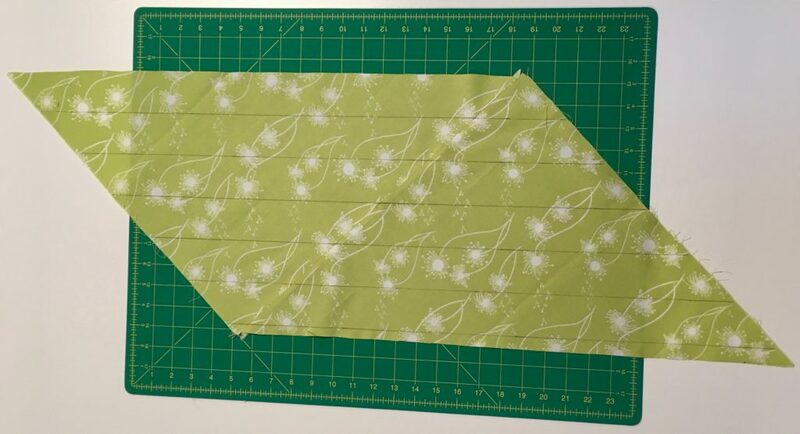 These instructions are for creating 1/2″ double fold bias tape, if you want to make a different width tape you will need to change the width of your lines to something other then 2″. 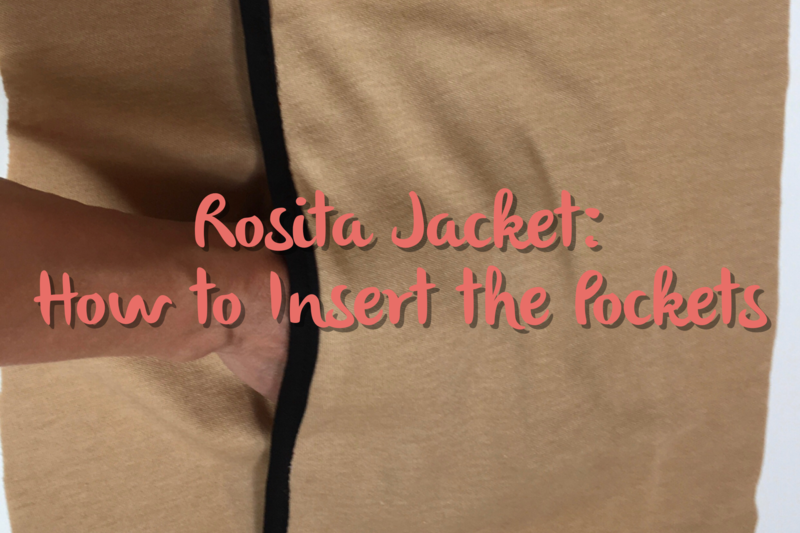 We hope you have fun with this technique for your Rosita Jacket and many of your other future projects. A smallish square yields a good amount of bias tape. 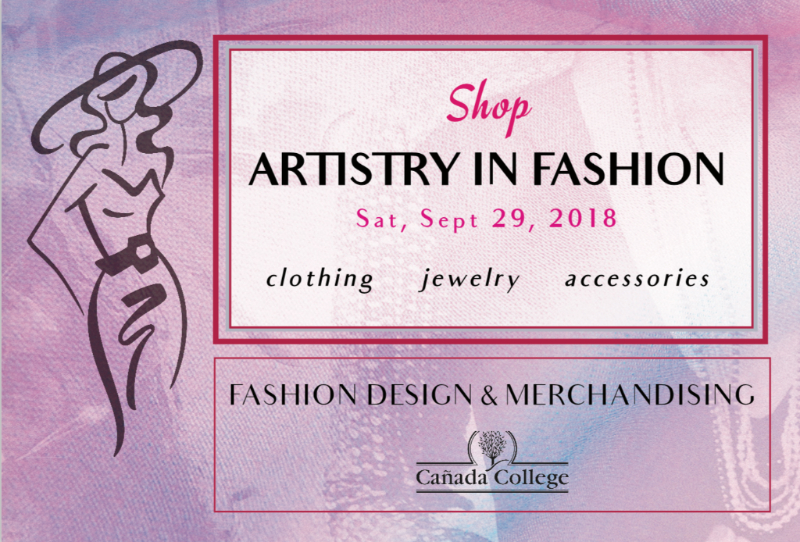 We encourage you to look to your fabric stash for interesting bits of charmeuse, linen, chambray, rayon, or any lightweight woven, to add designer interest to your creations. We look forward to your sharing your ZigZag Designs with us. We love to see your creations and with your permission, we would like to share them online. 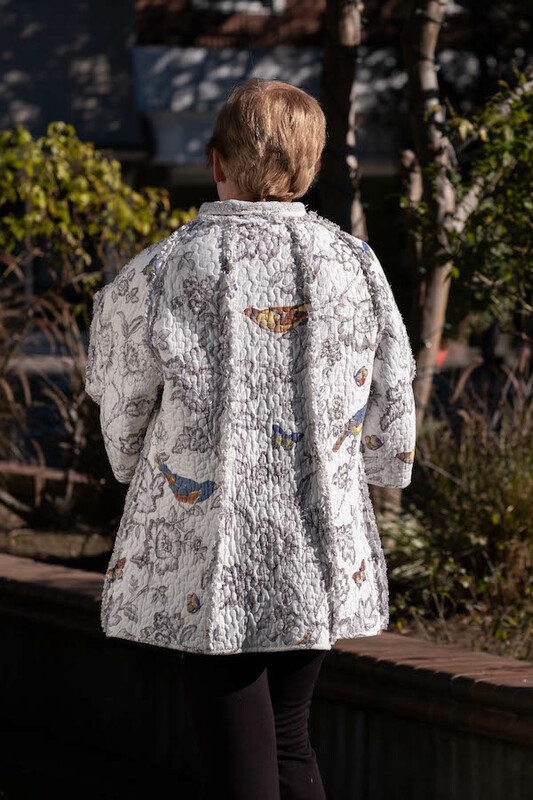 Releasing the Rosita Jacket (my first pattern for the home sewer), I imagine is a lot like raising a first child. I am hearing from you, my customers, friends, and peers, that this pattern (my first child!) is a good one, but she needs more instructions. Today, I’m writing this tutorial as one of two or three in a series to help clarify a few steps. 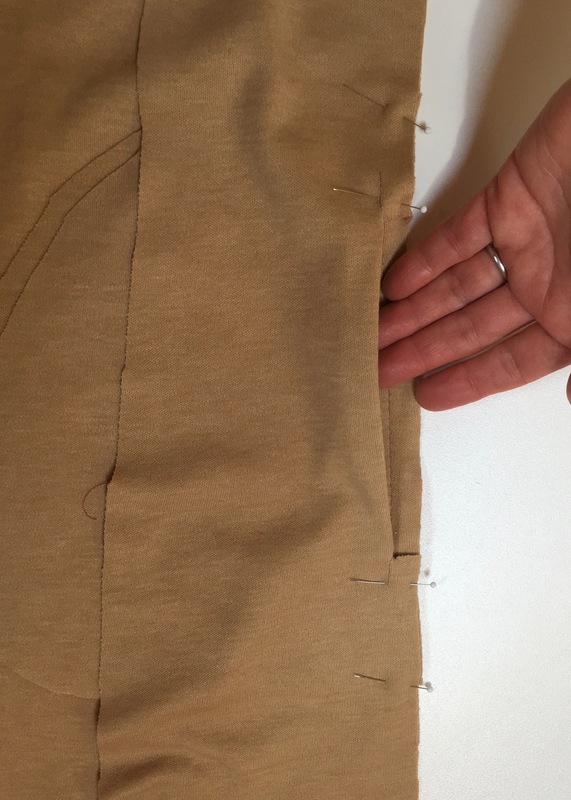 The first step being a ‘how to’ on the insertion of the hidden side seam pockets. Ultimately, my plan is to do a complete update to the Rosita pattern instructions, and to provide a revised copy to everyone who has purchased her. So, for now, here we go with the sew-a-long! 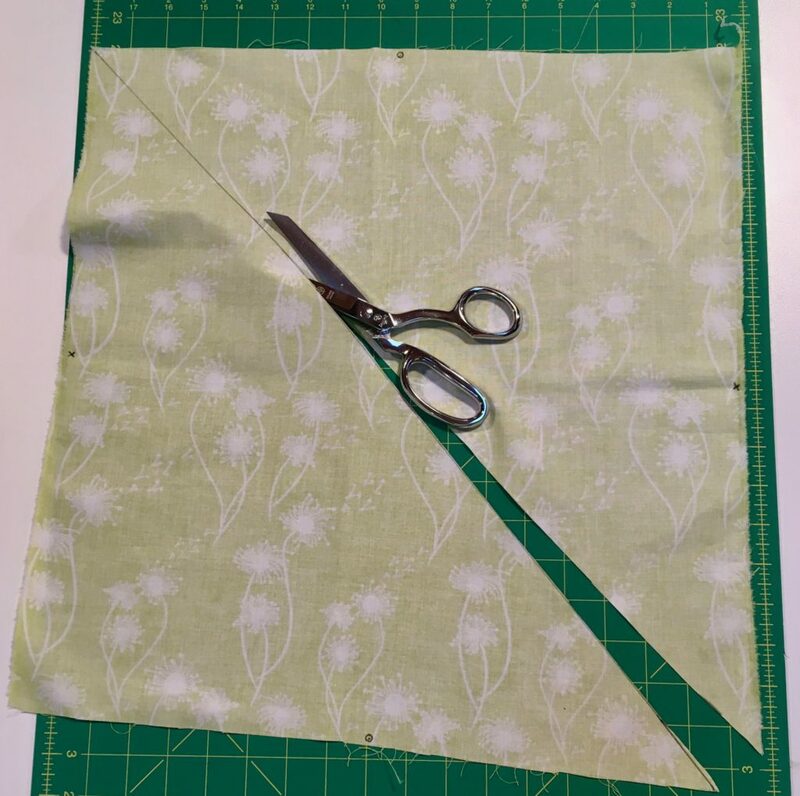 Reinforce the pocket notches on all four pocket bags (8 notches, 2 each pocket bag), the fronts (4 notches, 2 each front), and side fronts (4 notches, 2 each side front) by stay stitching along the seam line of each notch for about 1″. Matching notches, pin pocket bags to center fronts, WRONG sides together. Pocket bags pinned to center fronts WRONG sides together. 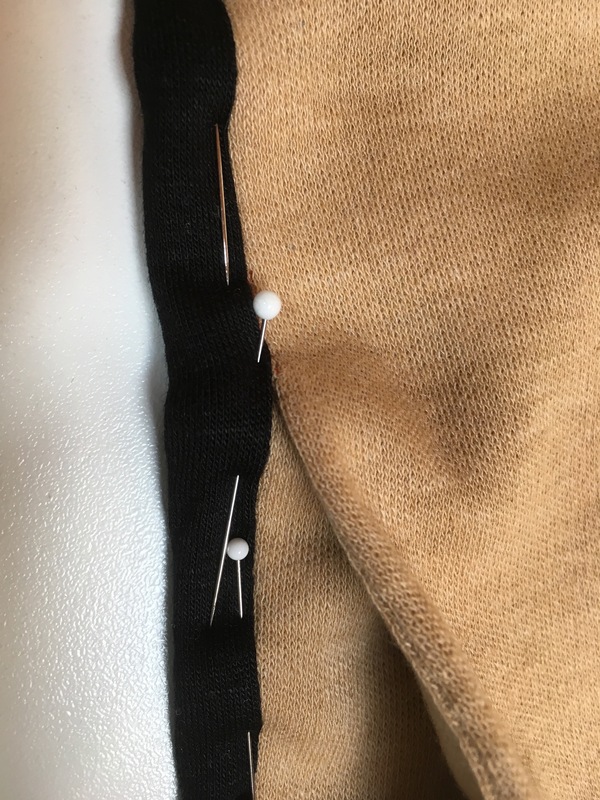 Extra tip – I use straight pins to mark the RIGHT side of the fabric so I don’t get confused. 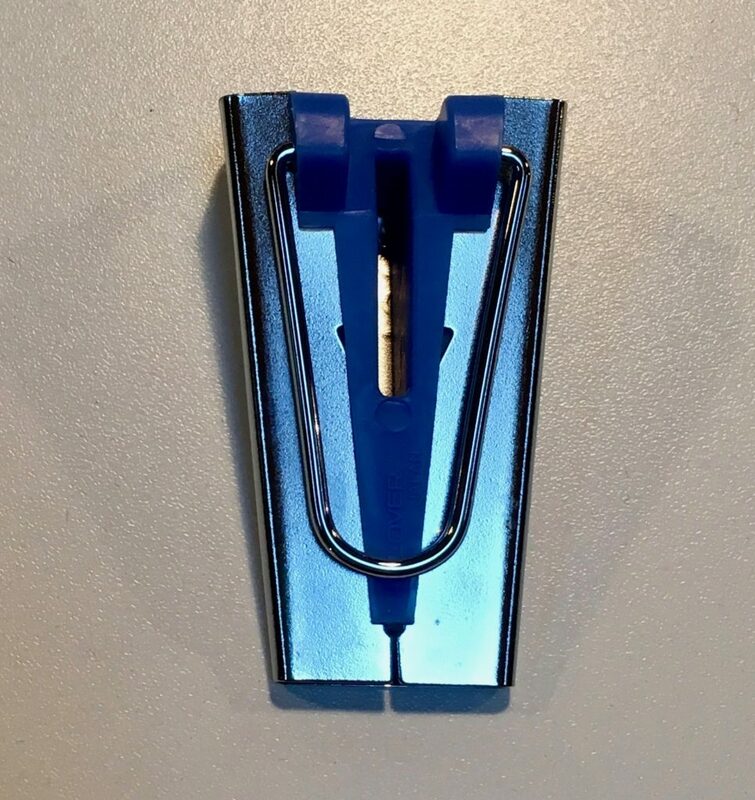 Those straight pins are visible in this image. 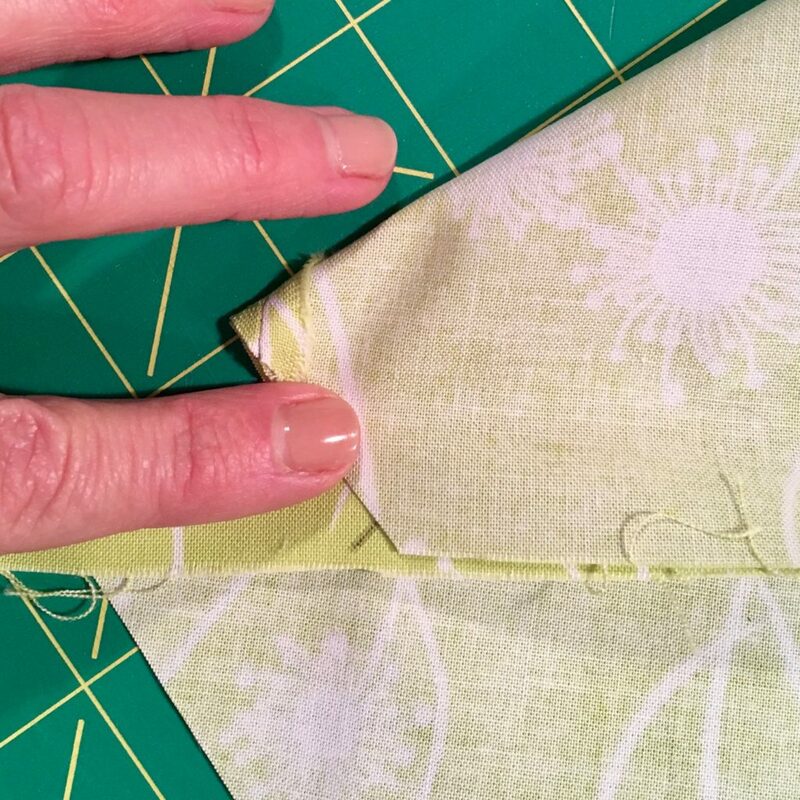 Stitch the pocket bags to the center fronts, the entire length of the pocket bag, top to bottom, through each notch. Matching notches, pin pocket bags to side fronts, RIGHT sides together. 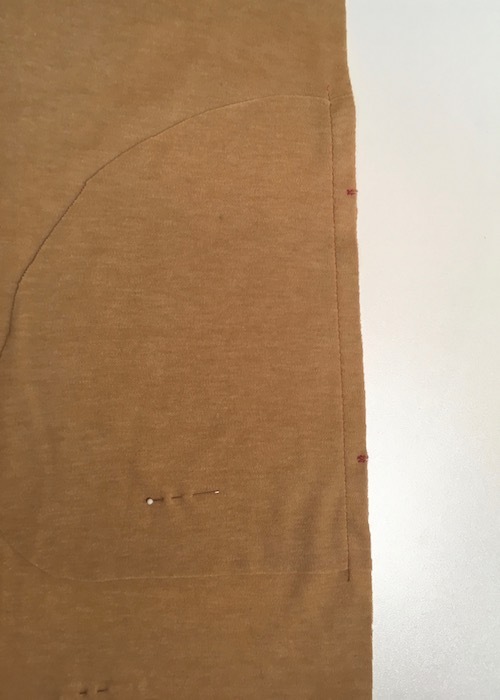 Stitch in place between notches only. 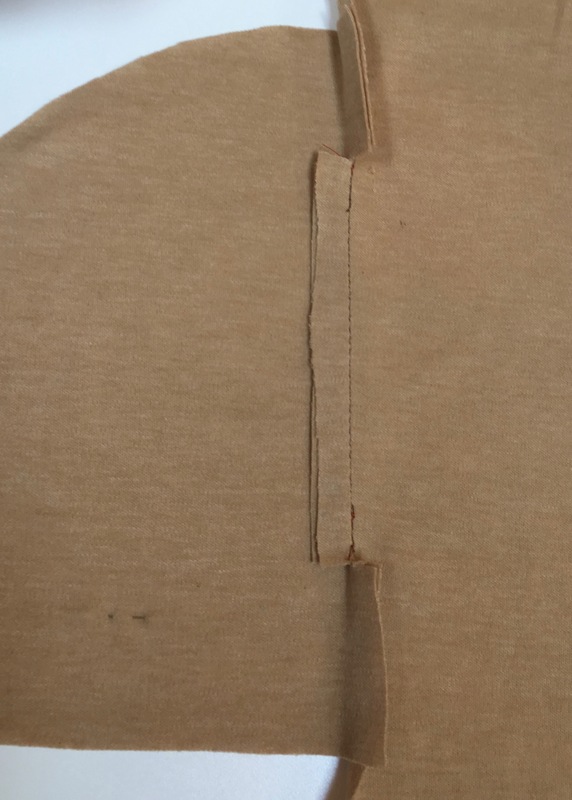 4a) Then, clip seam to, but not through, each notch. 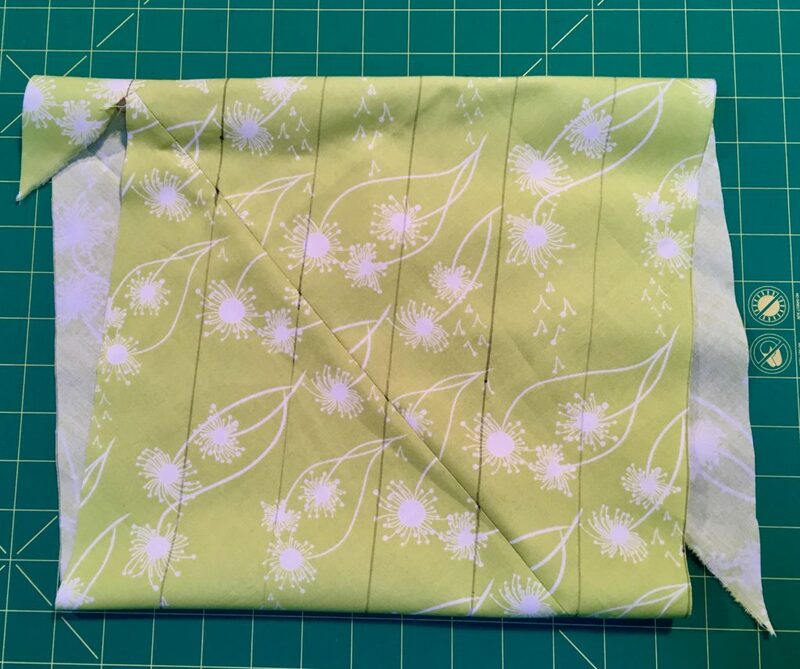 4d) Edge stitch the seam allowance in place to each pocket bag between notches only. Matching notches, pin side fronts to center fronts, WRONG sides together. 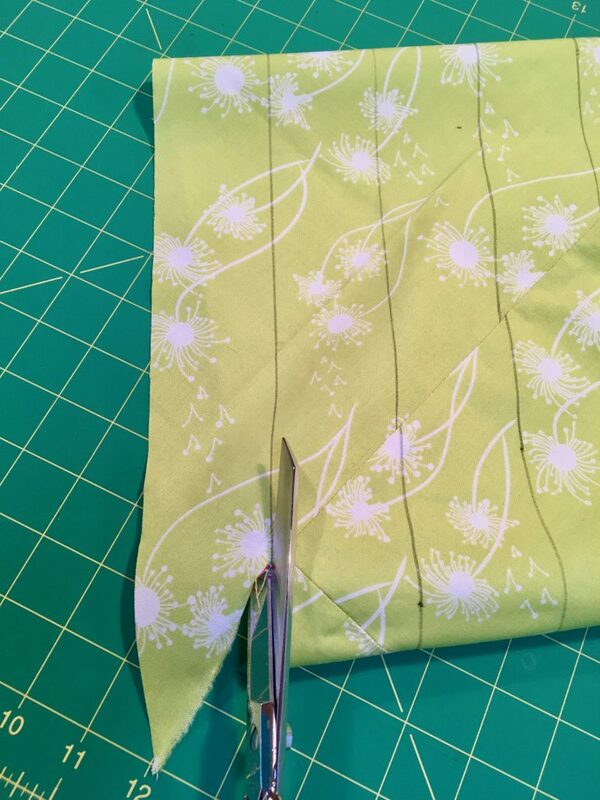 Stitch the entire length of the seam leaving open between notches on pocket bags. 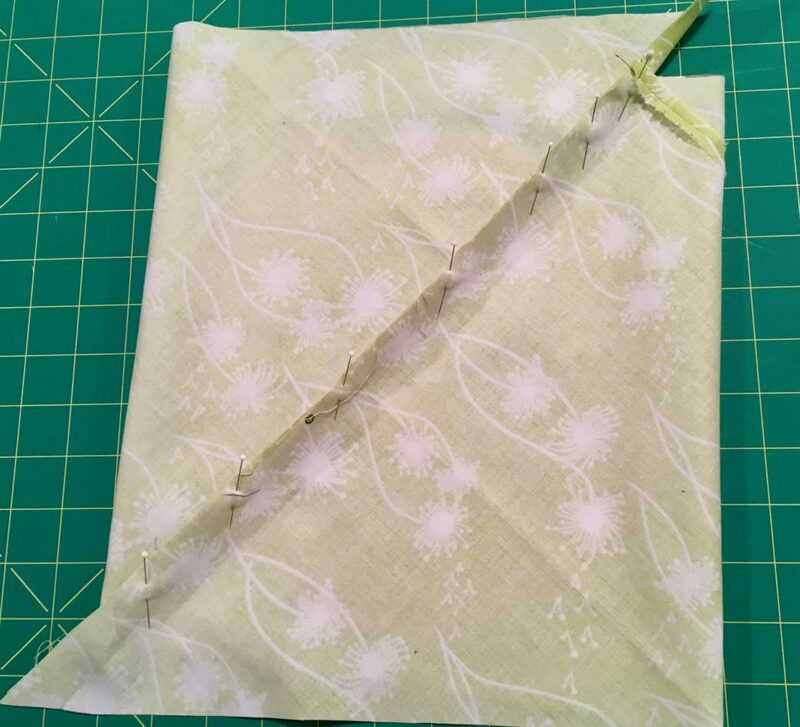 5a) Grade pocket bag seam allowances on either side of the pocket bag, if necessary. 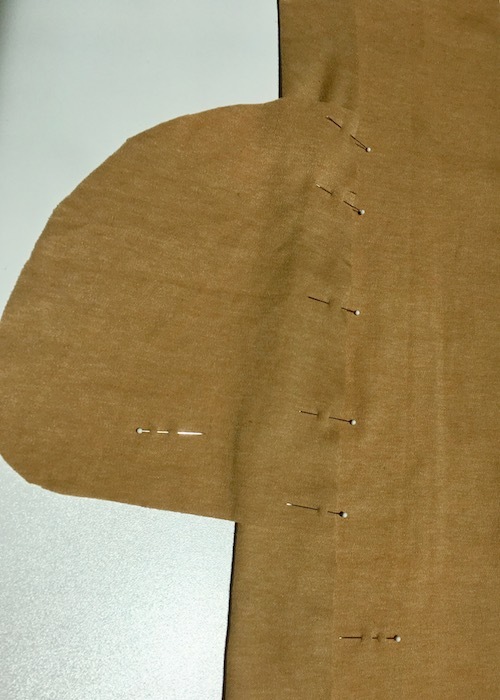 Pin binding along the entire edge of the center/side front seam, including the exposed pocket bag seam allowances. 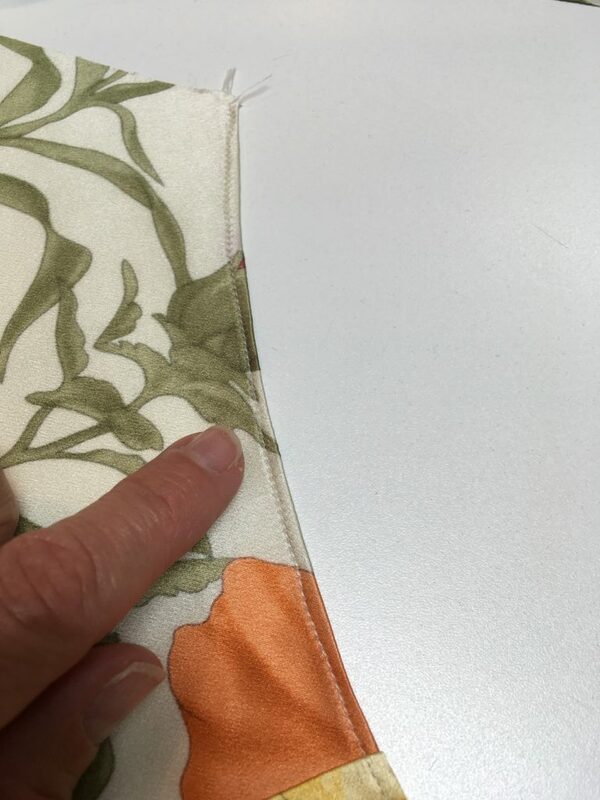 The finished, hidden, in-seam pocket should look like the images immediately below when finished. 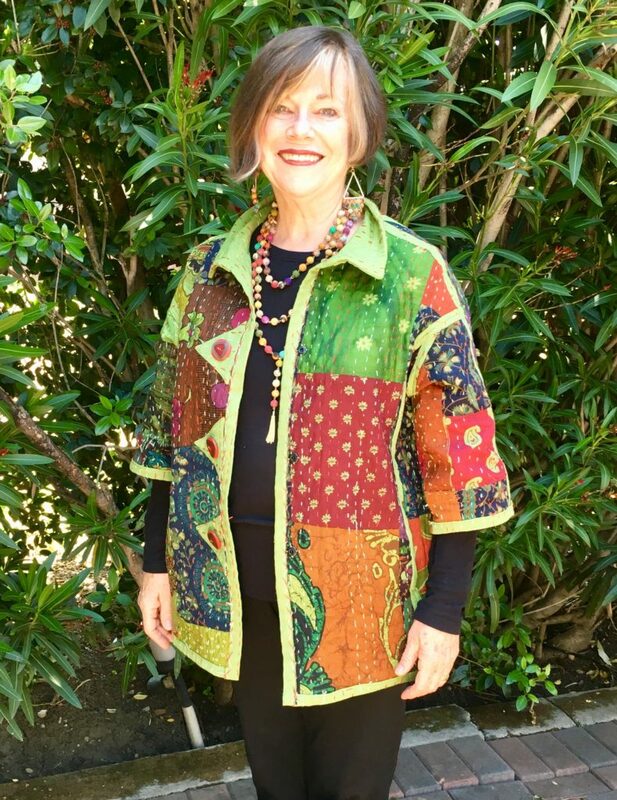 I love making the Rosita Jacket with pockets. I hope now with these instructions you do, too!!! As always, I’m here if you need me. 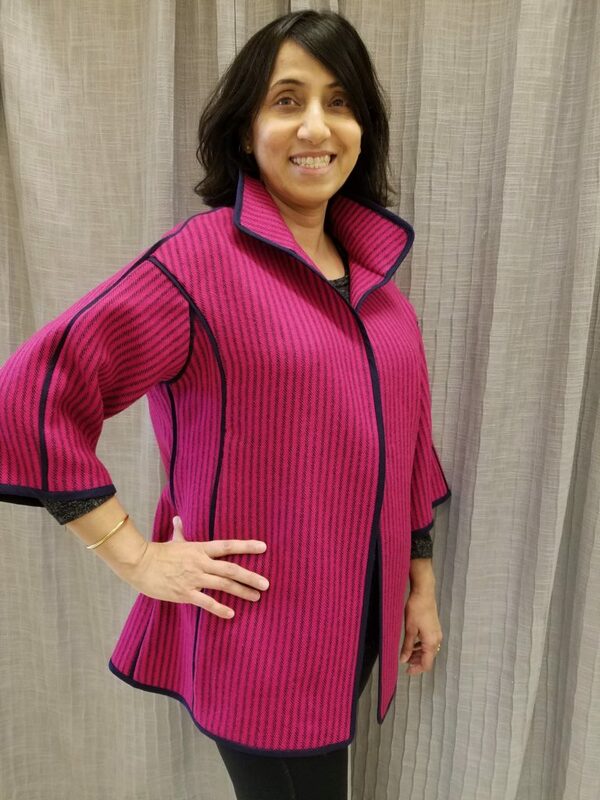 Feel free to send me an email if you have questions or comments at christinegroom@zigzagdesigns.biz And please send images of your Rosita so we can share your inspiring garment with others. As I sit and sew alone, like most of you do, too, I find that I have so many things I want to share with the sewing community. Some of them you may already be familiar with, but if not, they may be game changers for you, so I have to share! 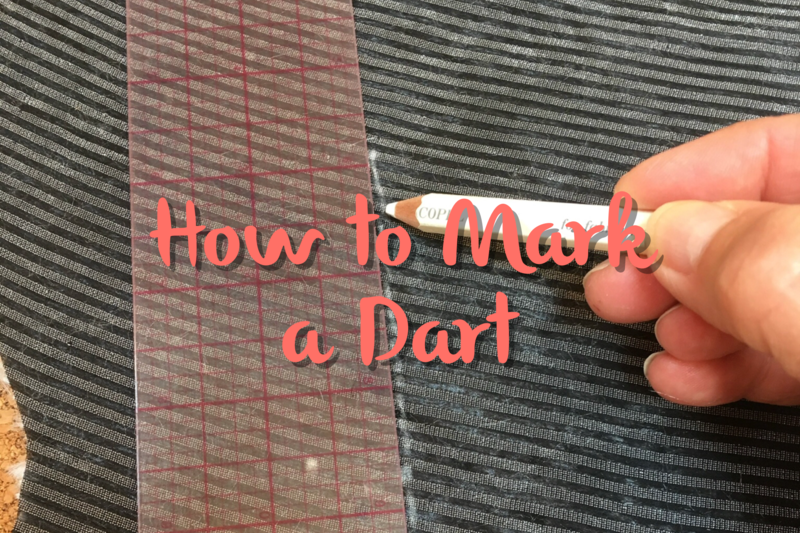 I hope you enjoy this quick tip on how to easily and accurately mark darts. Put a 12” x 12” corkboard underneath the dart to be marked, with the pattern still in place and attached. 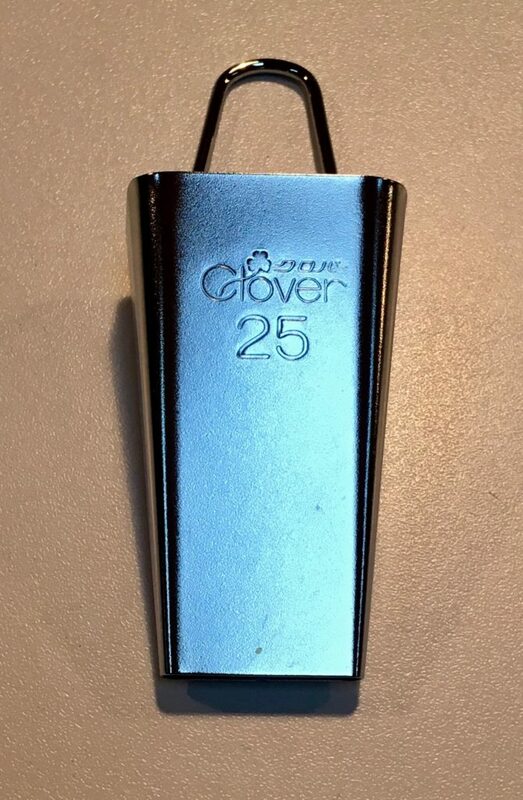 Insert pins through all thicknesses at the dart tip, midway through the dart legs, and at the dart leg/seam allowance intersections. Here is a quick video demonstrating the process. This is what the marks should look like after completing Step 1. 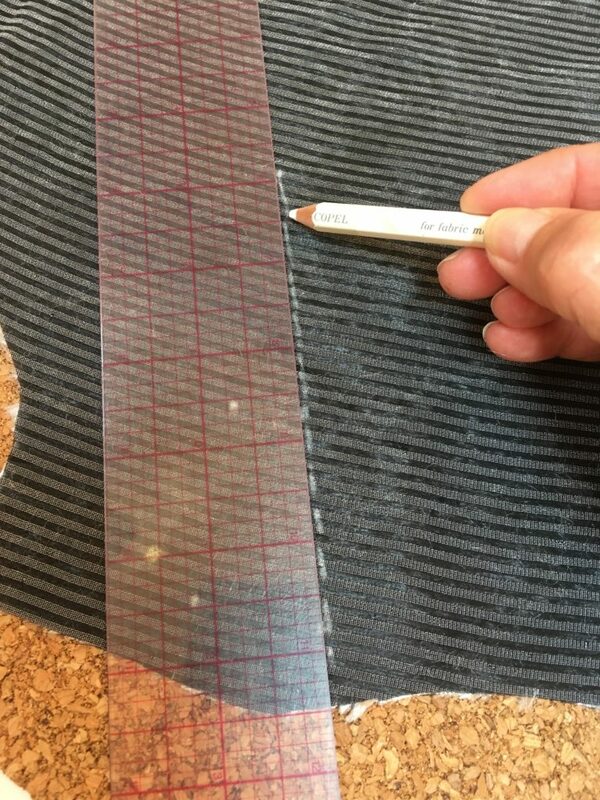 On the wrong side of the fabric, line up a see-through ruler along one dart leg’s marking points and draw a line with your removable marker. Repeat for the other dart leg. 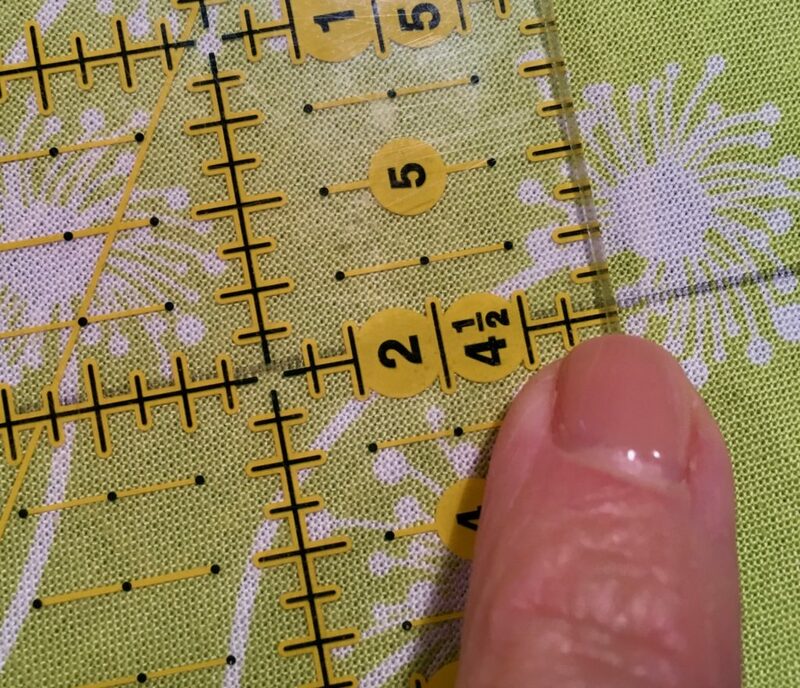 Use a ruler as a guide to mark the line. Both dart legs drawn in. 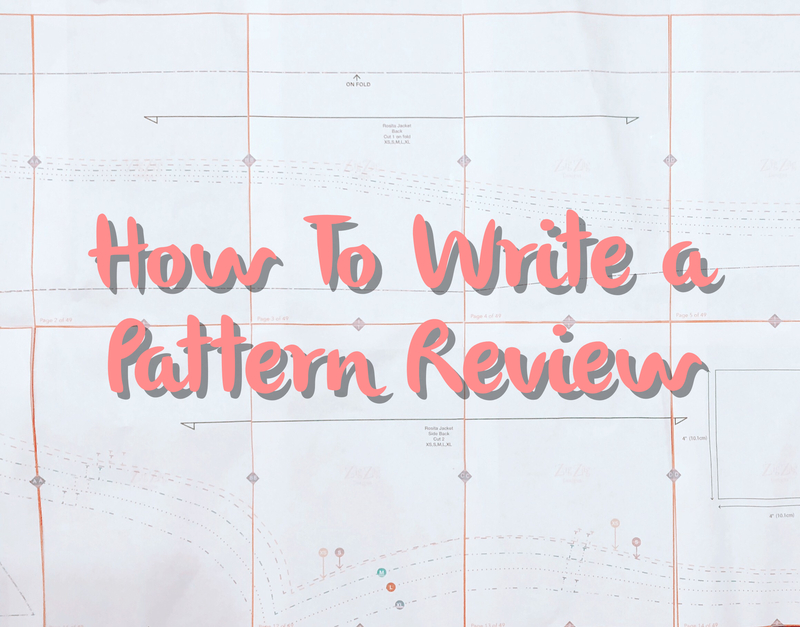 Writing a Pattern Review is Easier Than You Think! Here’s How. 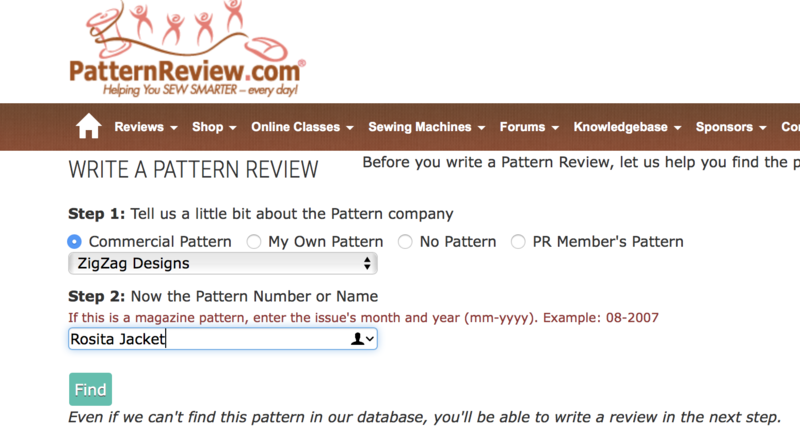 Since its inception, in 2001, PatternReview.com has become a resource for sewers all over the world. 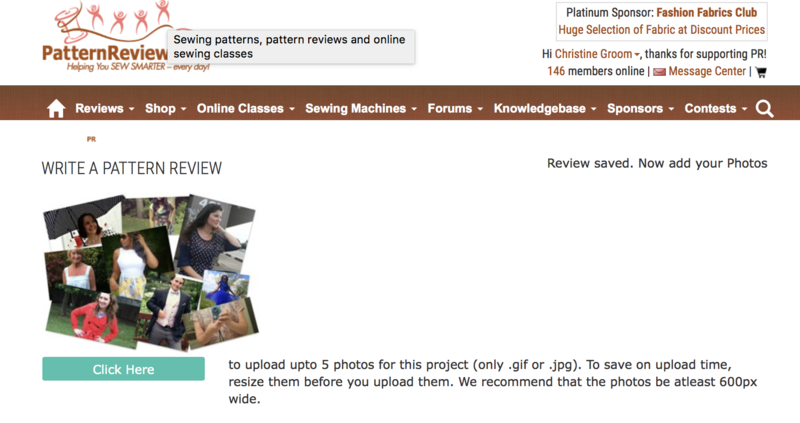 Over 400,000 members use the site to read and write reviews on patterns they have made or are interested in making, post and answer questions as group topics, participate in sewing contests, hold discussions on everything from sewing machines and equipment and yes, even about people like us, independent pattern designers. 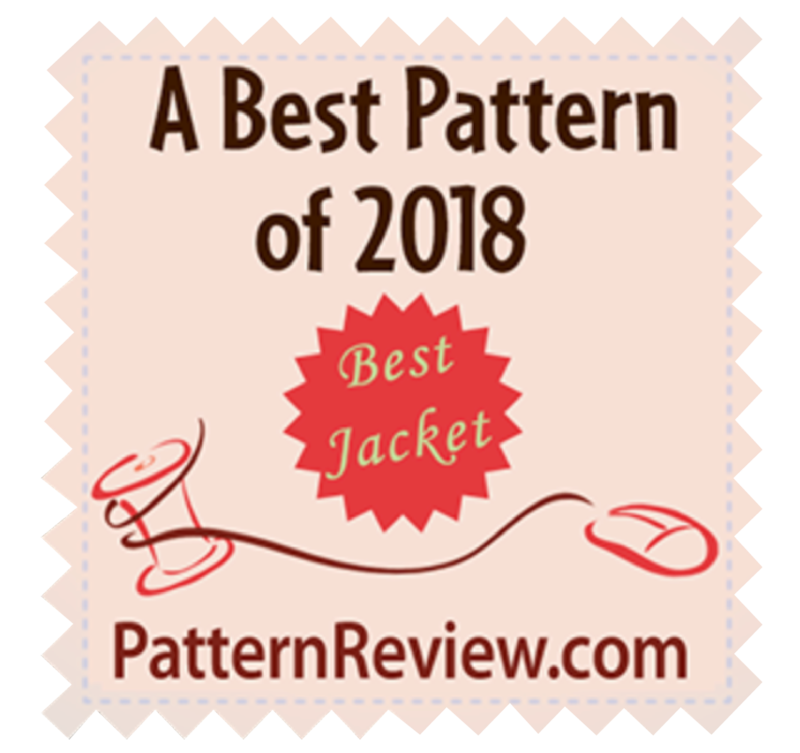 We are writing this blog to express our gratitude to those of you who already use and post reviews of your experiences with patterns, and to encourage you keep it up and to give it a try if you haven’t yet posted a review. When you take the 10 minutes or so to inform others of your experience, you help so many people decide if the same pattern is right for them. In your review, you will cover topics such as, how well the pattern came together, if the instructions were solid and clear, if you made any alterations, if you would make it again, etc. You will also post a few pictures, preferably of you in your garment, but on a dress form works well too, if you are camera shy. Try to take at least 3 images; front, side, and back views. Have them ready to upload before you start your review. How to manage your images is covered in Step 10 of this blog. If you’ve never uploaded images before, please read Step 10 first and get your images all ready to go before writing your review. If you’re ready, lets get started with the tutorial! If you don’t have an account yet, please create one. It’s easy to sign up and membership is free! From the menu bar, choose “Reviews”, then select “Write a Review” at the bottom of the option list. In the next window, you will be asked, “What type of review do you want to write?” Select “Pattern” and then click “Next”. 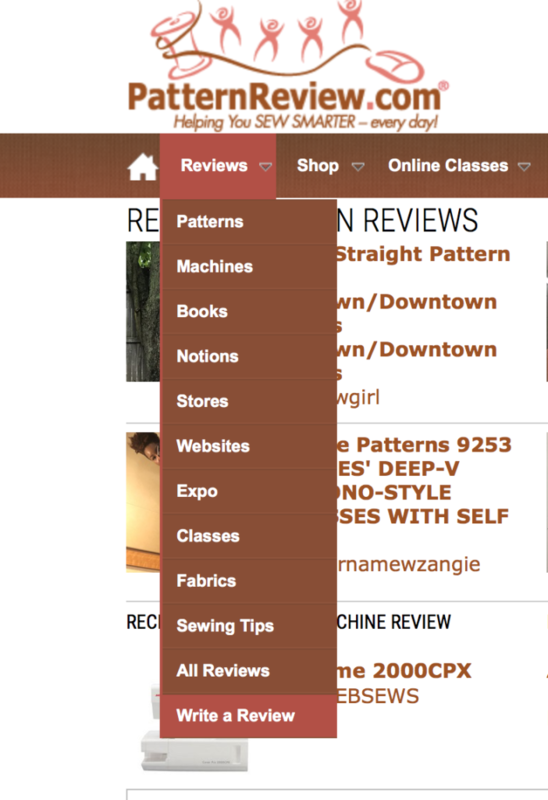 Then, from the “Choose Pattern Company” drop down box, click the up/down arrows to activate the list, and scroll to find the pattern company you want to review. They are listed in alphabetical order, so scroll almost all the way to the bottom to find ZigZag Designs, and highlight your selection. The pattern field will populate automatically after you select a company. 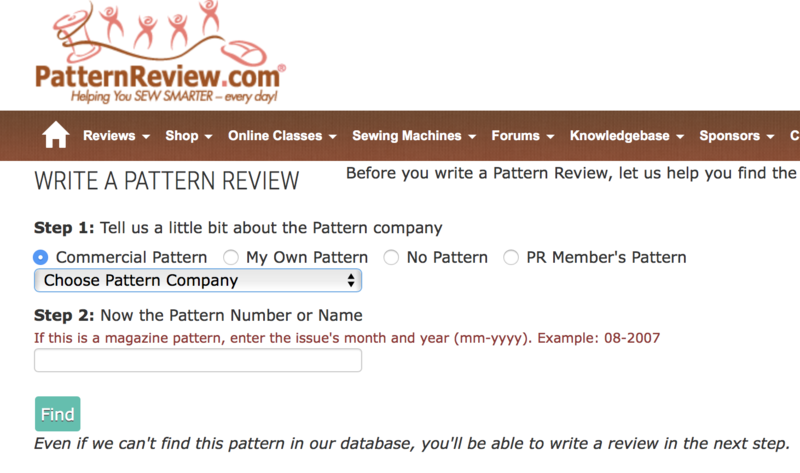 Once you’ve made your pattern company selection, proceed to Step 2, “Now the Pattern Number or Name”. 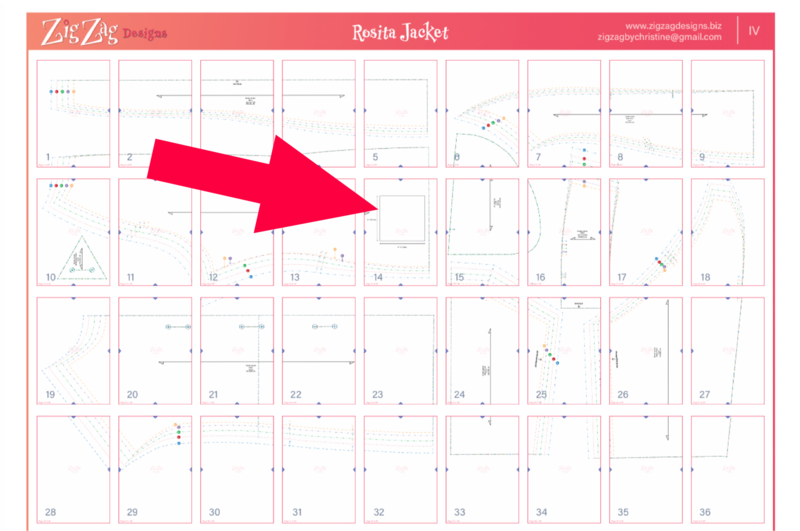 (Ex: ZigZag Design patterns are named Rosita Jacket, Tammy Top, etc.). Simply type in the pattern name and then select the “Find” button. 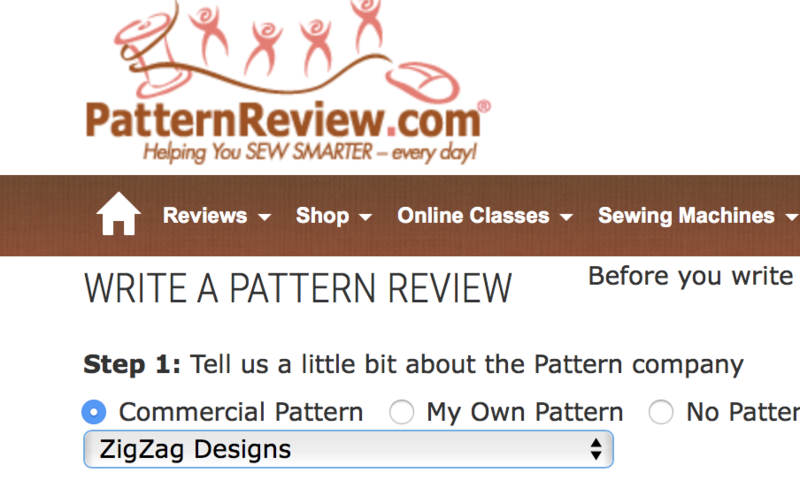 If you are the first to review a pattern, great! Someone has to start the conversation, and we and the Pattern Review community will be glad you did! 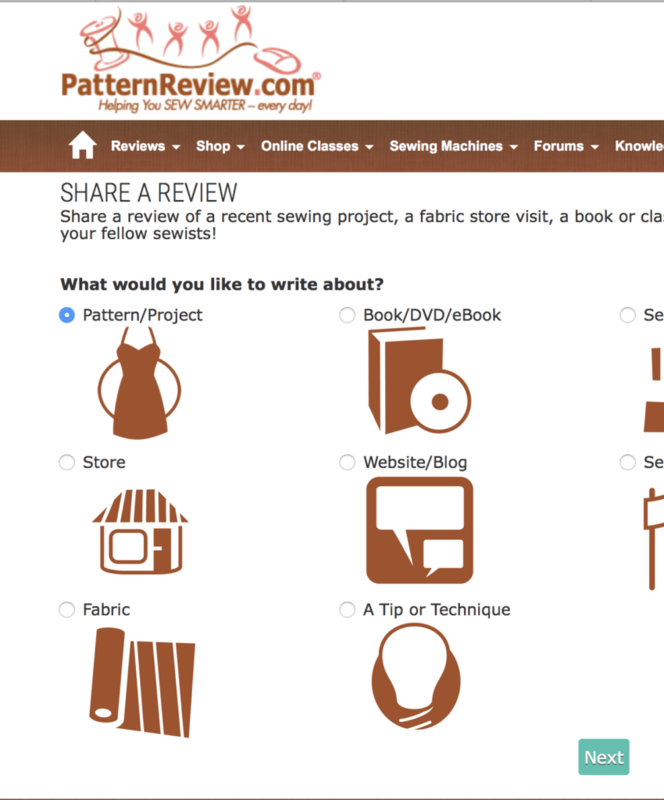 After selecting the “Find” button in the previous step, you will arrive at the “Write a Pattern Review” window. Select the “Write a Review” button. You will then be taken to the window form where you will write your review. PatternReview.com has made this process really simple for users. You will find a series of check boxes, drop down lists, rating stars, and then the big review box. Be sure to click the “Click here to load a template to help you write a review” button. This template is truly handy if you don’t know how to get started or what to write. Just answer all the questions that you want to and erase the rest if they are not applicable or if you don’t care to respond. 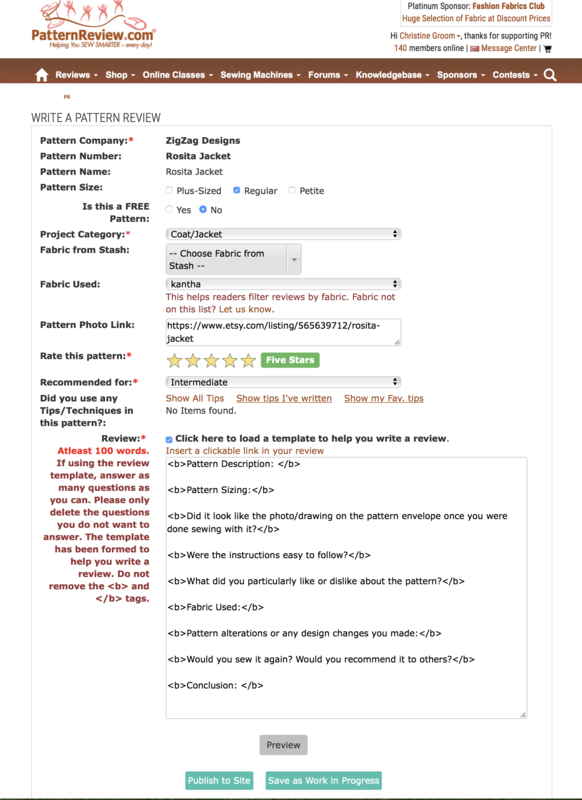 Important: In the “Pattern Photo Link” box, be sure to give a nod to the pattern designer and put a link to their pattern in this space. After selecting and checking all the boxes and writing your review, you may preview what you’ve completed, save as “work in progress”, or publish your review to the site. You should play with and explore these options, but for the purpose of this tutorial, let’s move right along to “publish to site”. After you select “publish to site”, you will be directed to a window where you can load your images. 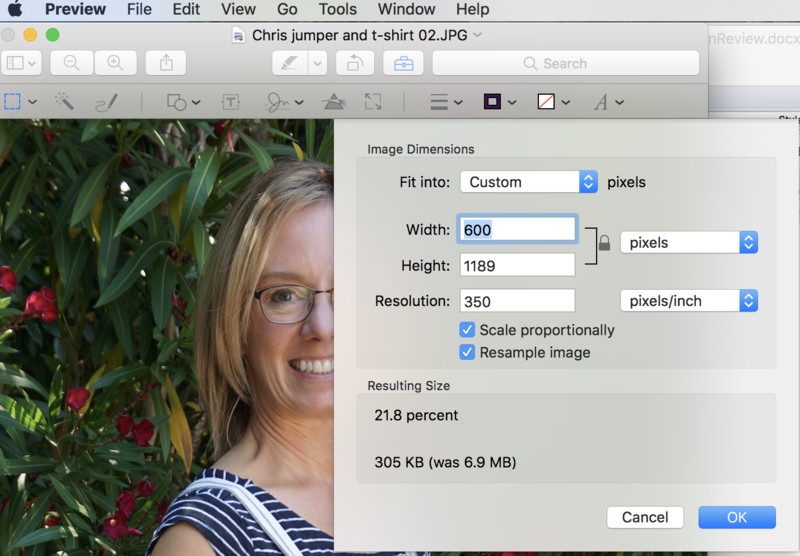 Your images need to be formatted as .gif or .jpg only, and should be 600px wide. You should use your editing tools in your image software to crop in close to the garment, rotate the image to the right side up position, and enhance any color or exposure issues if you think would make the image better. We use iPhoto to crop, enhance and rotate the image. Then, move the image to your desktop by clicking on the image and dragging it to the desktop. By doing this, it will automatically be saved as a .jpg, so that takes care of one of the Pattern Review image requirements. Whew! Once you have all of your images on the desktop (you can load up to 5), open them with the “Preview” application. 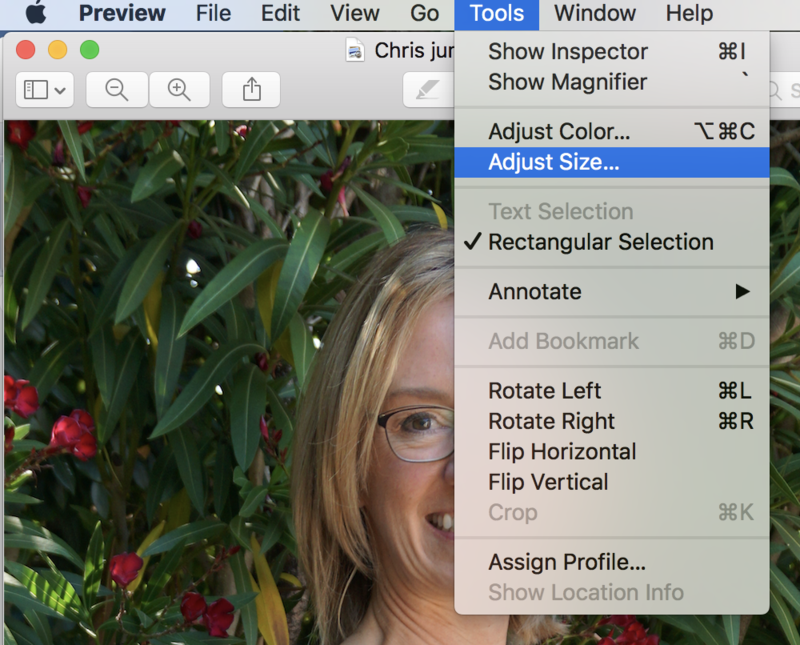 Select “Tools” from the menu bar, and then “Adjust Size”. Change the width to 600 (don’t worry about the height) and then click “Save”. With your images ready to go, click the “click here” button on the “image loading window” shown in Step 10. You will be redirected to a window where you can select up to 5 images to upload. To do this, activate the first “choose file” box by pointing your curser and clicking on the first “no file selected” box. When you click in each “no file selected” box, you will have the opportunity to choose the image file you want to upload from your desktop’s directory. Each of the 5 images (you can use just one if you like, but more are appreciated) must be selected individually, so repeat this step for each image. Notice the right hand column titled “Main Photo”? 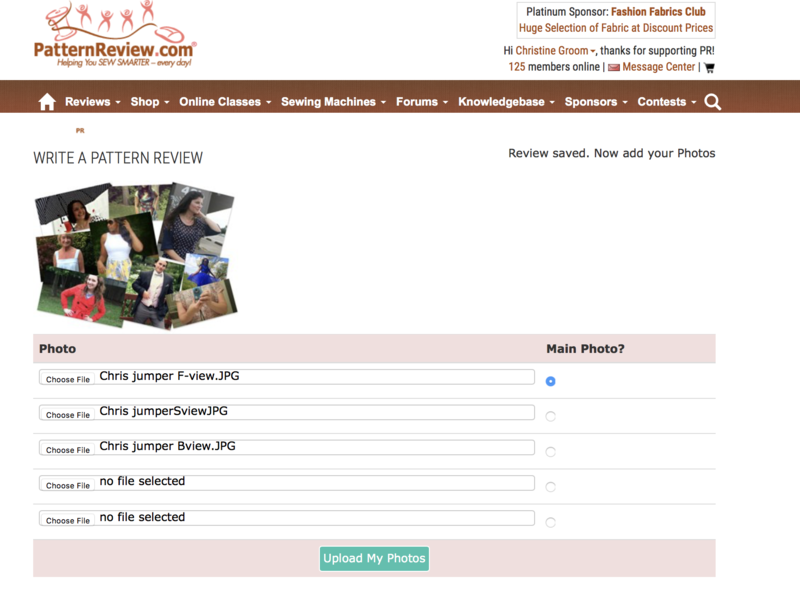 Select one of your images to be the main photo for the review. Then, select the “Upload My Photos” button to start the upload process. 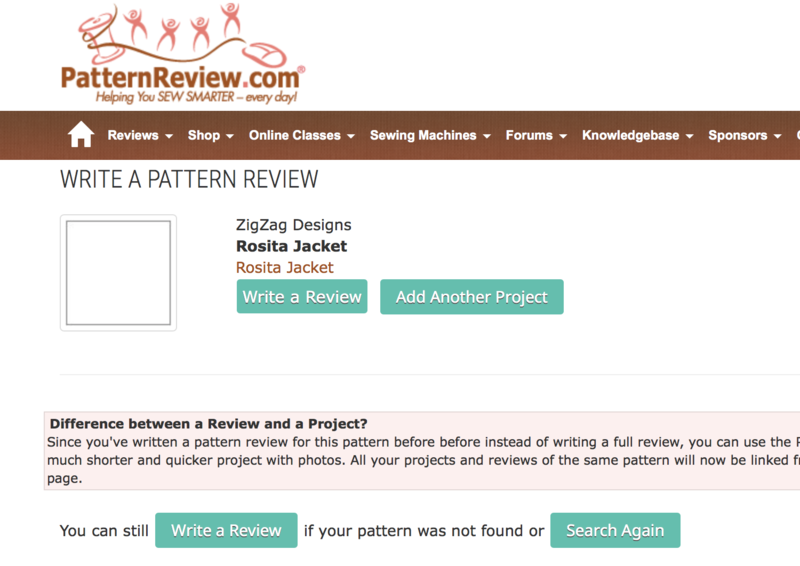 That’s it – you have posted a review to PatternReview.com!!!! Whoopie!!! The community will now begin to comment and thank you for your review. 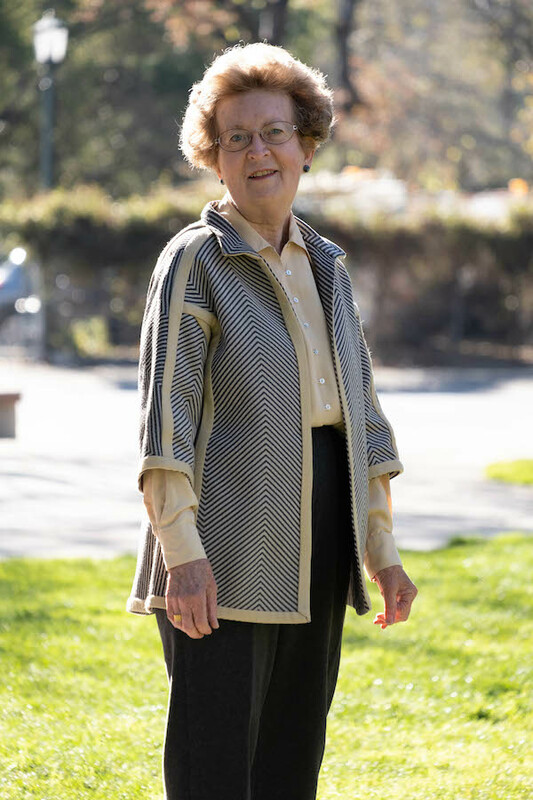 As an independent pattern maker, we need your support to review each garment you make from our patterns. If you make more than one of any pattern, you can add it to the review you just posted at a later date. Please do take the 10 minutes to share your experience with our patterns with the Pattern Review community. 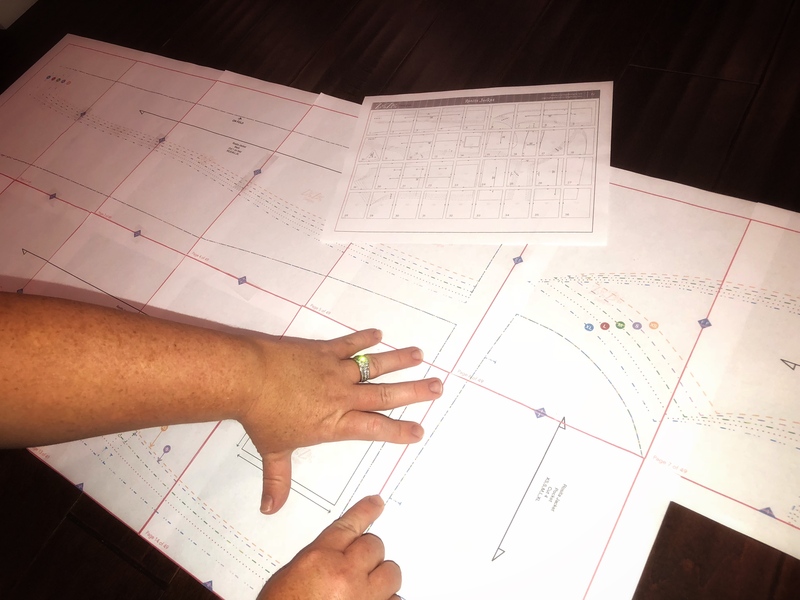 We work very hard to produce solid patterns you can trust every time for consistent, accurate, and positive results. If it is anything less, we want to hear from you so that we have the opportunity to solve the problem. Thank you for your time. We hope this tutorial was helpful and inspiring. We look forward to your reviews!! 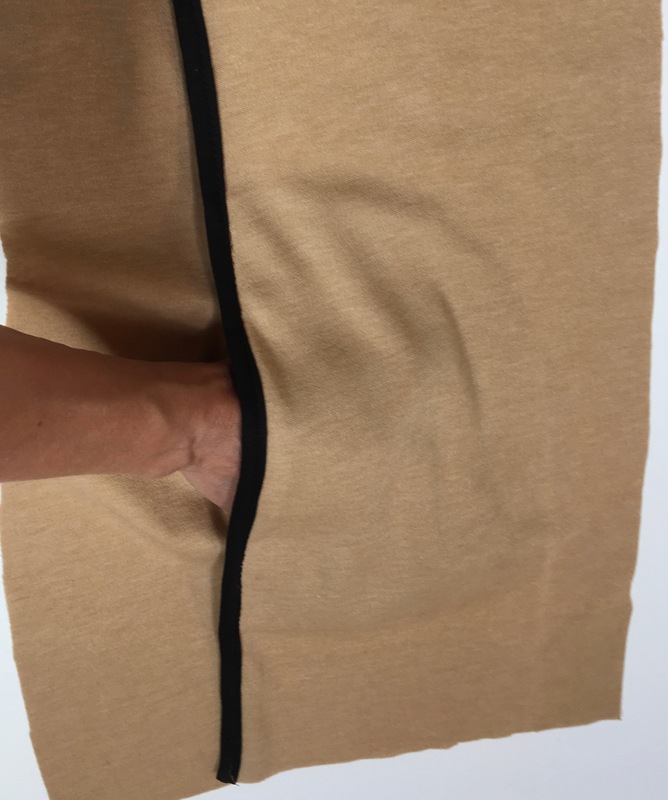 I’m encouraged by how passionate people are about their sewing patterns; not just the style and fit of them, but how they are packaged as well. Before venturing into the pattern making business, I gave considerable thought to what my product was going to look and feel like. I chose to go the way of electronic PDF files for a few reasons. Primarily, I chose this method for environmental concerns. I hate the paper waste of pre-printed patterns. 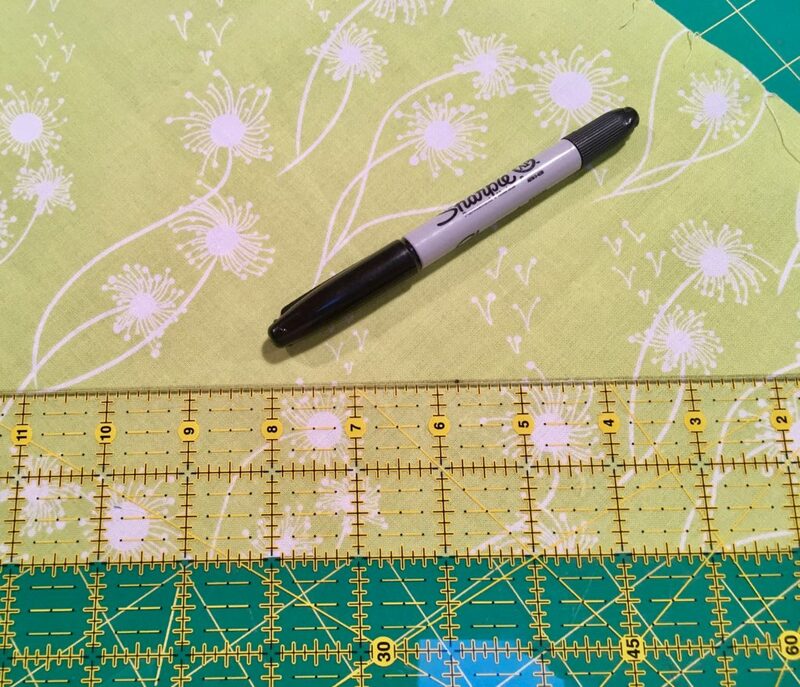 As a user of commercial patterns, for many years before I became a pattern maker, I have purchased my fair share of them, most of which have never been opened. I have accumulated quite a collection which created a storage problem. So, I bought containers to store them in, and then the containers needed to be stored, etc. I think you see where I am going with this! I find that PDF patterns are easier to file and sort electronically, making for better record keeping of what I own. I keep my files in “cloud” storage (I use Dropbox). Having them electronically filed keeps me from buying duplicates, as I can quickly search and find out if I already own a particular pattern. Additionally, it provides for easier and more savvy fabric shopping. 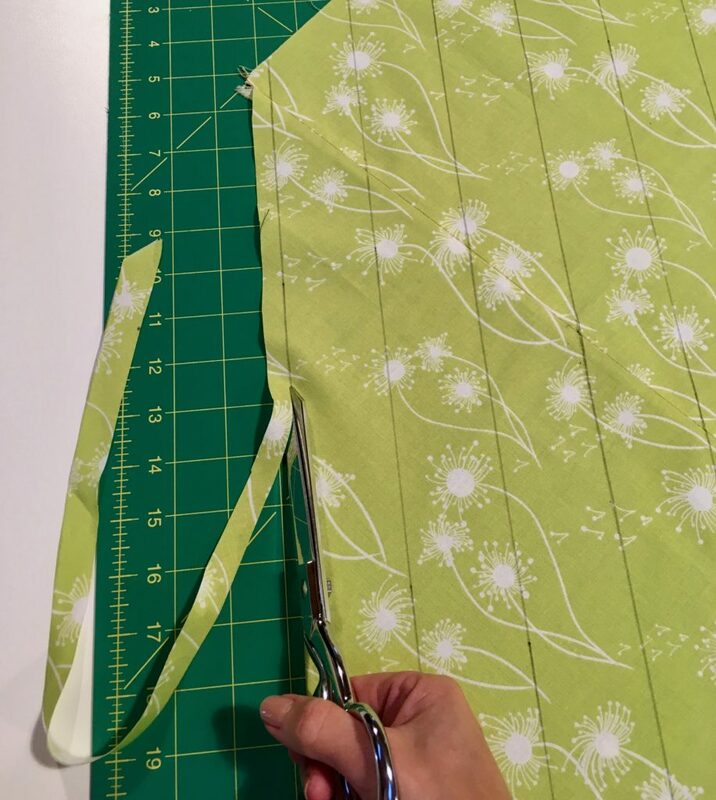 I can call up my folder for dresses, for example, on my electronic device, pick a pattern and review it’s yardage requirements while I’m in the store. No more guessing what I might need! If I had decided to go the way of printed patterns, I feel I would have been contributing to the problem, as I see it, of paper collections. There is a lot of waste in that. Let’s take a minute to think about the waste: the ink and paper that would be used to print patterns, the cost of producing, shipping, selling and storing them in multiple fabric store venues and in my studio, and then the time and money it would take to put the patterns into more paper, envelopes, and mail them to the end user. And, lets not forget the unlikely possibility that they might not sell (tongue and cheek here!) and end up in the landfill. But this decision is not met without adversity; however, there are those who have not yet tried to print and assemble the home printer ‘tiles’, some who have and are just not fond of the process, and others have not yet found an economical way to have the large format PDF file printed for them. Today, I’d like to address of few of those concerns. I produce two types of electronic files. Both are included with your pattern purchase. One of them is in a large format, intended to be printed at your local printing company, and the other is formatted in 8 1/2 x 11 inch “tiles”. These “tiles” are intended to be printed on your home printer, and assembling them should be easy after you ensure your print set-up is correct. So, here we go with the tutorial portion of this blog! Unfortunately, not all printing companies are priced the same. Be sure to shop around and find the most economical solution for your needs. The file you receive from me is a 36” wide PDF. (The length will vary pattern to pattern depending on the number of pieces in the pattern.) You should be able to email the PDF file you receive from me to your printing company and ask for pricing before committing to the job. 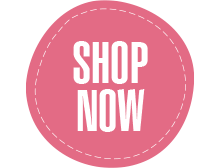 In doing this, you will be able to shop around from the comfort of your home and not only save yourself a bunch of time but also from any costly surprises at the time of checkout. In seeking out business printers, don’t forget to ask your local blueprint and banner printing companies too! Often I find they have much better pricing. Ask for black and white, not color printing. There is no need to pay the extra expense unless you want to. The file you receive from me comes as a nested, multi-sized set. The sizes are broken out in color and in different line styles. 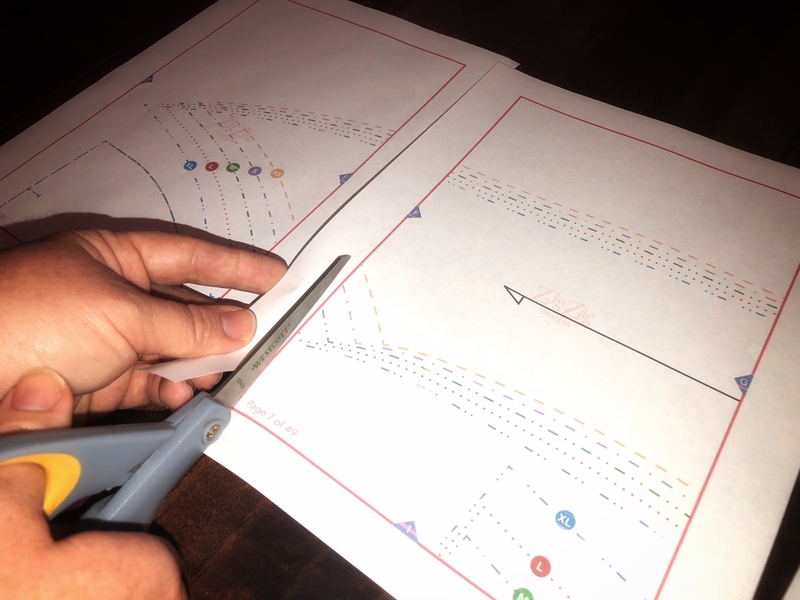 The line styles are different enough so that you will easily be able to identify your desired cutting line when you get it home. Follow the steps in the order provided below, and you should be on your way to easily printing out your tiled PDF pattern! Open the PDF file with Adobe Acrobat and find the page containing the 4 x 4 inch test square. Scroll to the page containing the test square and then select File > Print from the task bar. When the print dialog box appears, select the “Current Page” checkbox. In the “Page Scaling” checkbox, select “None”, or, if you see the “Page Sizing & Handling” section, select “Actual Size”. 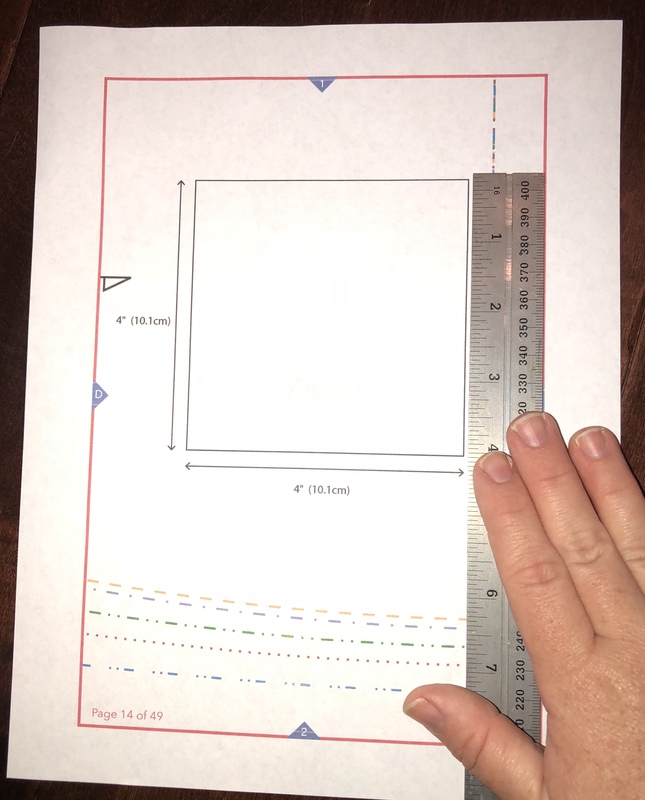 Print out the test square page only. 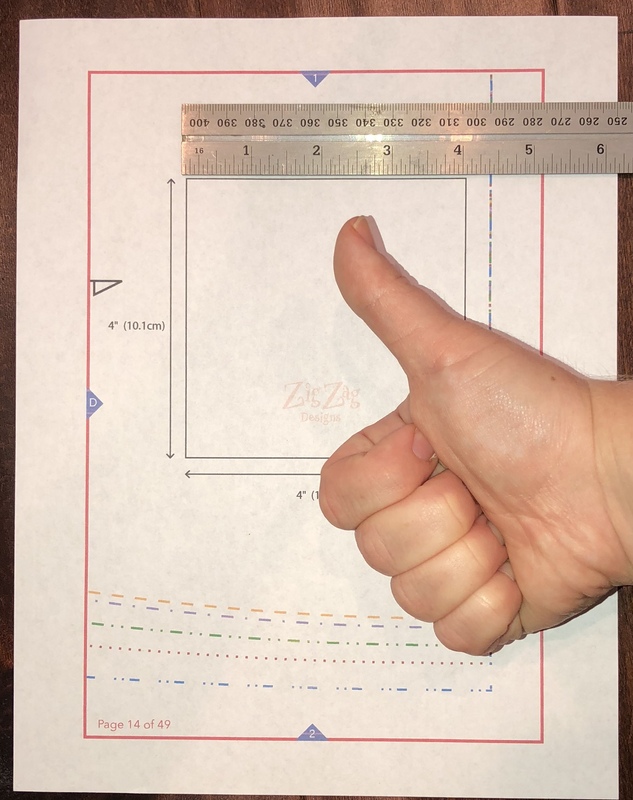 Using a ruler, check to ensure the printed square measures 4 x 4 inches. It’s important to get the test square printing out the right size before printing out the rest of the pattern tiles. If the square printed out 4 x 4 inches, do a little happy dance and then go ahead and print out the entire document at this time. 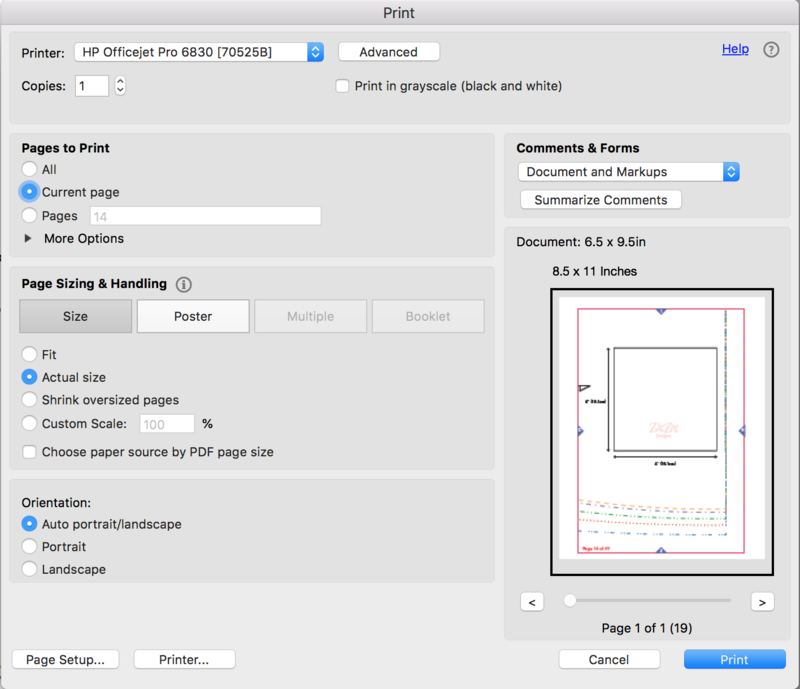 If the square did not print out 4 x 4 inches, you will need to refer to your printer user manual to see if your printer has a preference that my be over-ridding your print dialog box. Prepare your assembly space and put on your favorite TV show, Podcast or music selection. This will take about 30 minutes to complete. On a large surface area, and using your pattern layout map as a reference, layout the first row of tiles in the order they need to be assembled. For the first row, you only need to trim the left sides of each tile. When trimming, do not cut off the guideline. Hint: It’s easier to align properly when you align and stack the guidelines on top of each other before taping in place. For the remaining rows you need to trim the left and top sides of each tile. Again, be careful not to cut off the guidelines. While keeping the tiles in the correct order, trim them all before beginning beginning assembly. 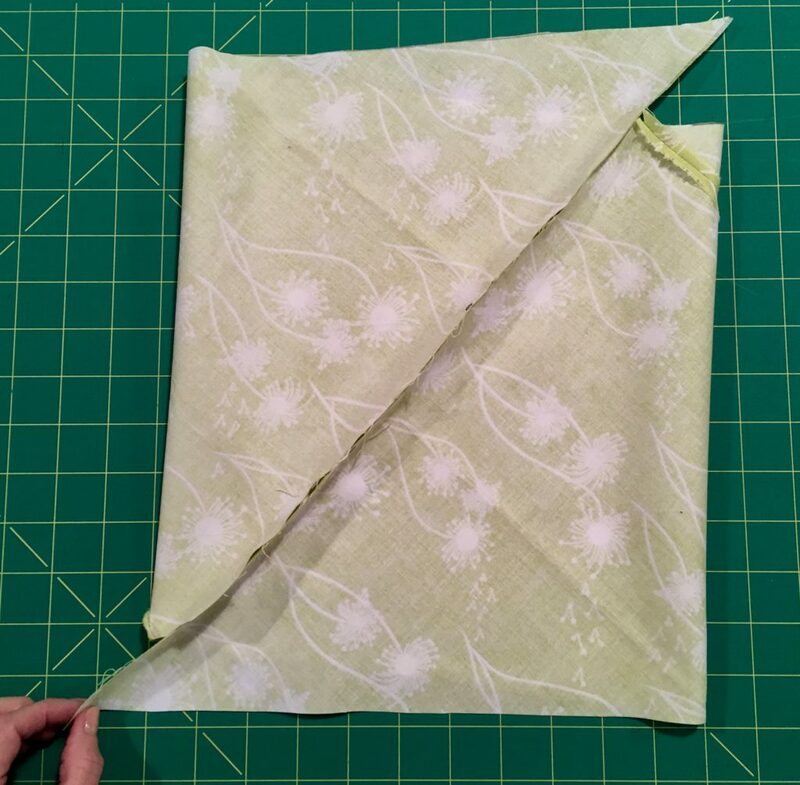 Once all of the pages are trimmed, continue referring to the pattern layout map as your guide and begin at the top. Then, in a left to right motion, align and tape the tiles together. You do not need to use a lot of tape for this assembly. You just need to secure the squares together with a small piece of tape in each corner and one in the middle of each guideline. 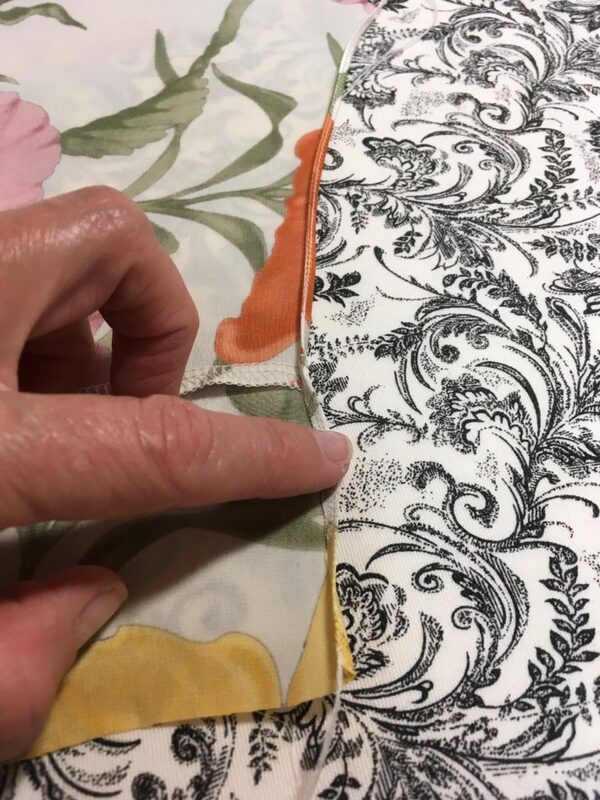 When you reach the last tile and have it secured, I recommend you trace the pattern pieces with your favorite tracing paper. The taped-together home printer paper pattern tiles are a little tough to deal with on fabric. And now you are done! Another happy dance at this point is entirely appropriate here. If you have any questions or concerns, please don’t hesitate to reach out to me! I am always happy to hear feedback and help in whatever way I can. You can email me at any time at zigzagbychristine@gmail.com. 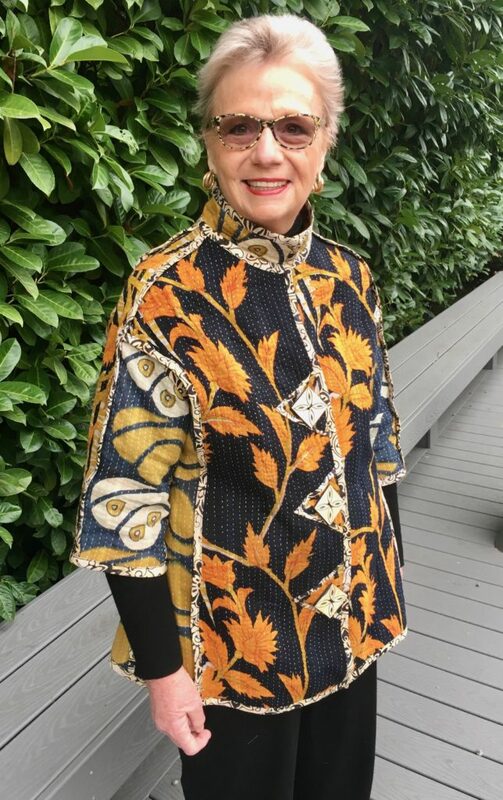 And, you can view and purchase all of my digital patterns, including my newest release, the Tammy Top, at my Etsy shop: https://www.etsy.com/shop/ZigZagPatterns. Because the Tammy Top is made with lightweight, floaty fabrics she begs for a very narrow or serged, hem. I thought it might be helpful to share with you how I approach this challenge. 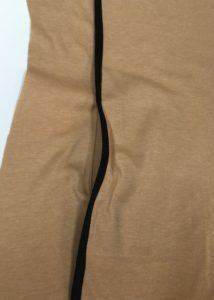 I will do this in two parts, the first being the very narrow rolled hem. The serged hem will follow in another blog soon. 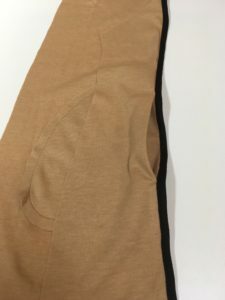 I know you’ve seen them – the very narrow hems in ready-to-wear, and perhaps you’ve been thinking, “they must have a special machine for that”, or otherwise have experts specializing in that step. And you would be right; they do. 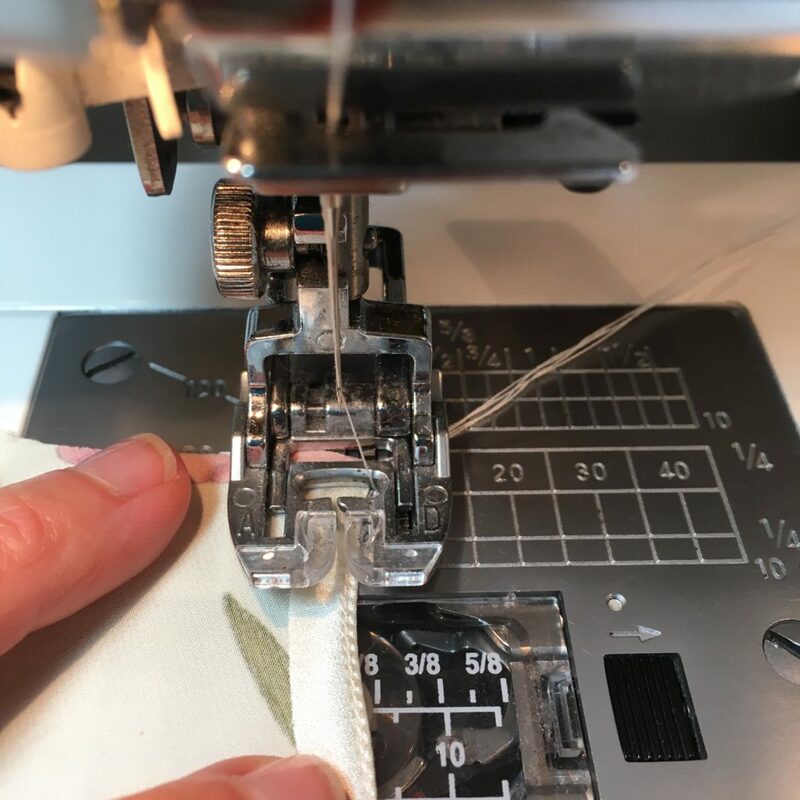 But I would like to tell you that you can do it, and without a rolled hem foot or single needle plate successfully, and in just a few steps. Now I know you are going to scroll down to see how many steps are shown here and gasp, but I promise you it’s not that hard! I’ve used a lot of wording in order to be clear. But, once you give it a try, you will understand, and I’m confident you will be able to repeat it on your own. So, here we go! 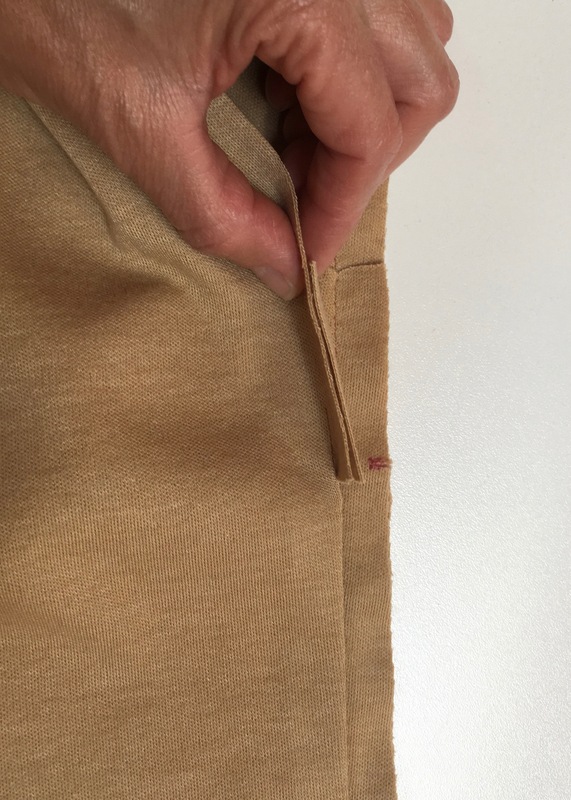 How to make a very narrow rolled hem by machine. 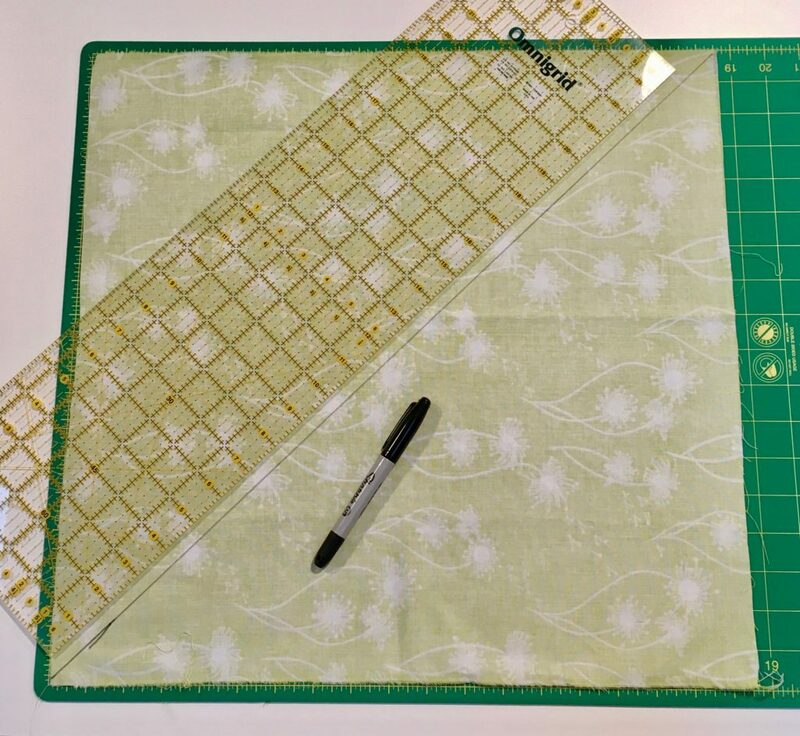 Place pattern piece, with paper pattern still attached, on your ironing board. 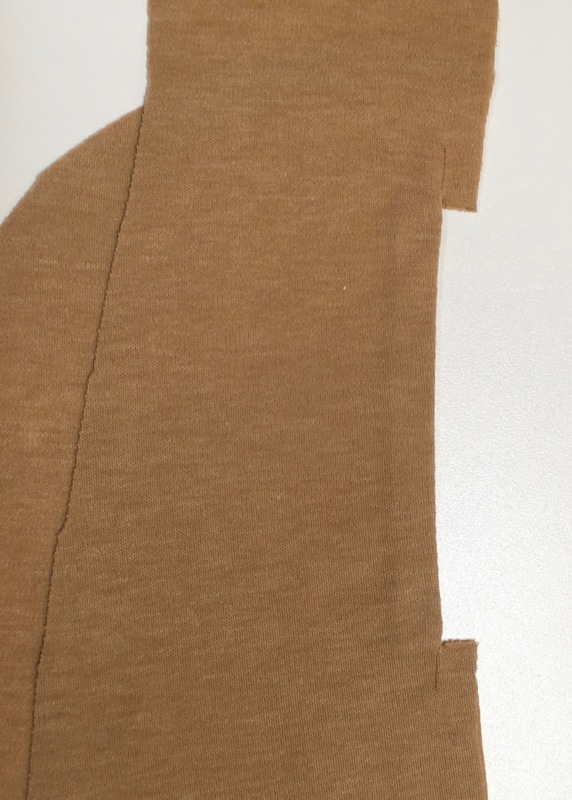 Position the piece so that the hem is in a good place for you to press without moving it once the paper pattern is removed. 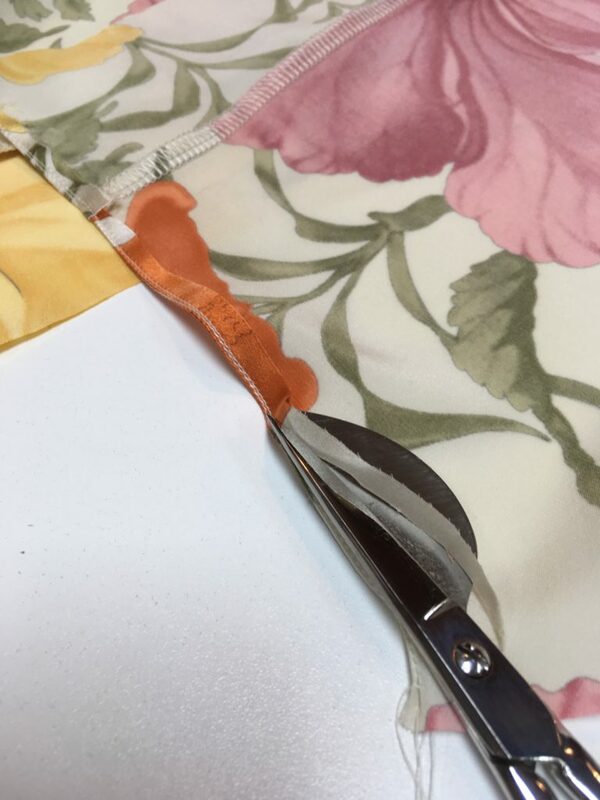 Carefully remove the paper pattern without moving the fabric piece. If you accidentally move it don’t panic, just carefully put it back in the right shape by using your paper pattern as your guide. Spray the hem edge narrowly with canned spray starch. 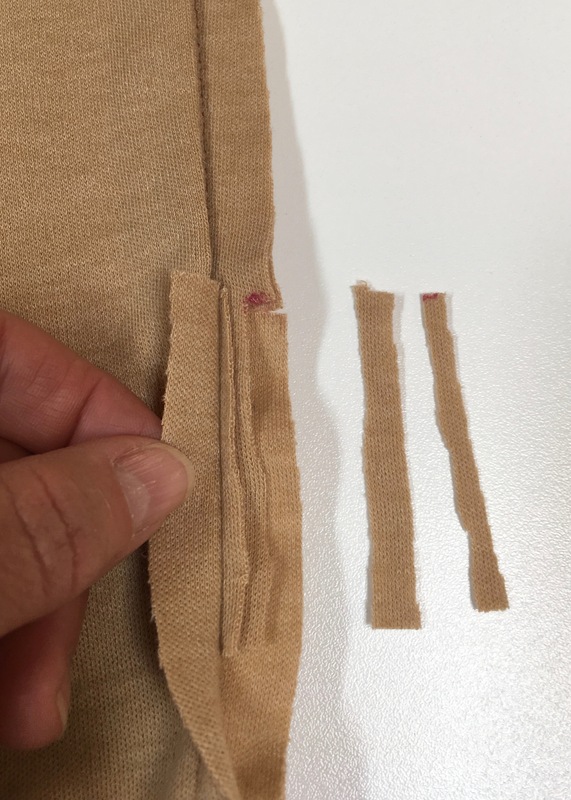 You should test a scrap of fabric first to be sure no bleeding or staining occurs with your fabric. 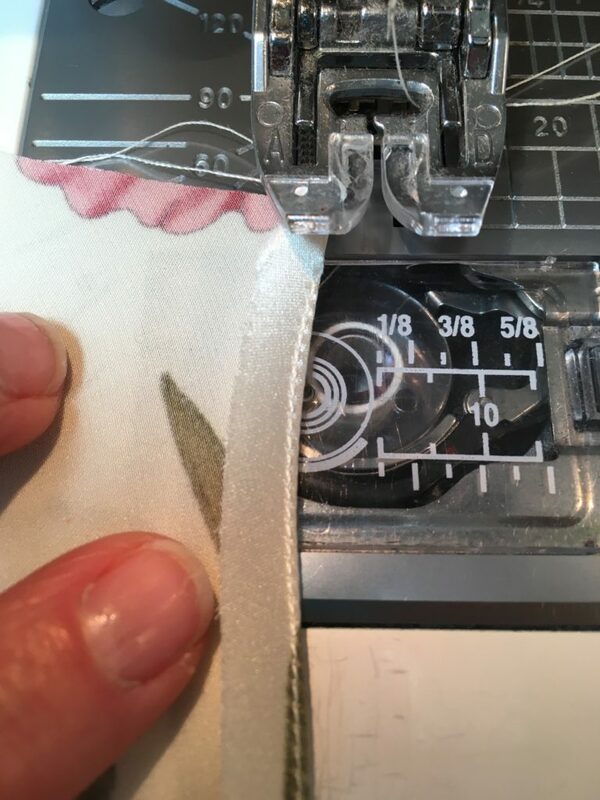 Insert the correct needle in your machine for the fabric you are sewing. 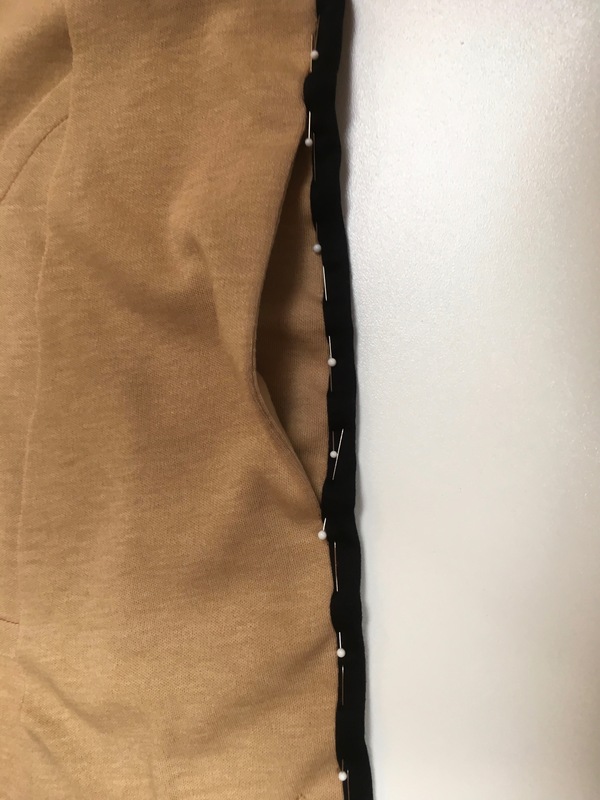 In general, for all fabrics intended for the Tammy Top, you should be using a 60 or 70, nothing larger. 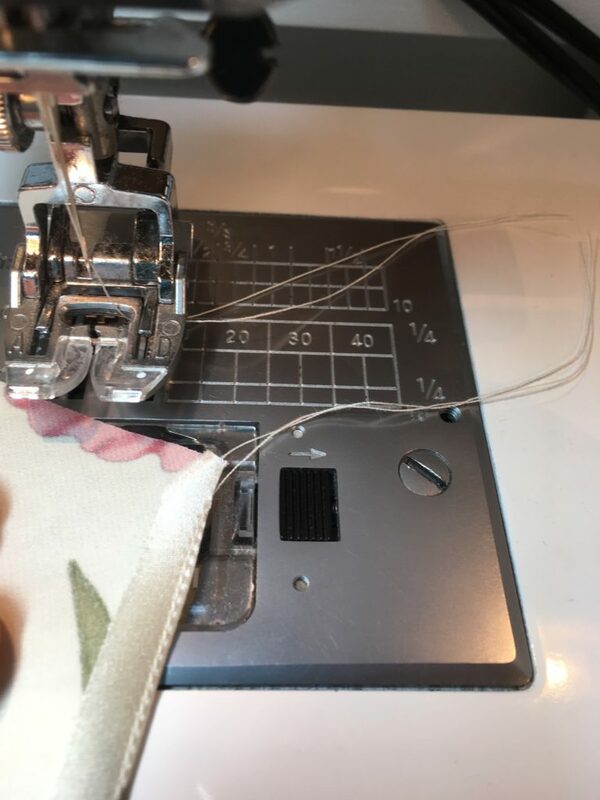 Set your stitch length between 1.8 and 2.0 and reduce your tension to about 3.0 (Do a test on the scrap you spray starched earlier to be sure). Pull out about 3” – 4” of thread tails, from the upper and bobbin threads, towards the back of the presser foot. 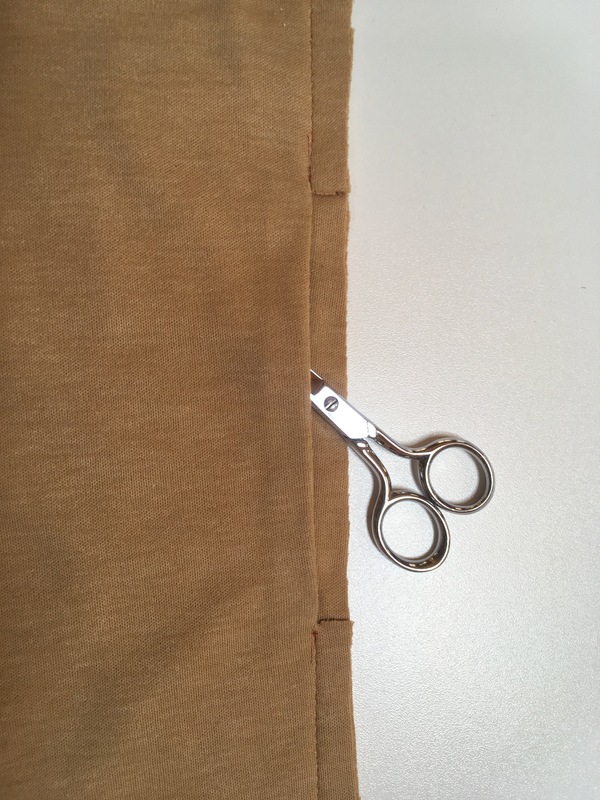 Position the raw edge of the hem so that you will start your stitch about ¼’ from the leading edge and 3/8” from the hem edge (do not begin the stitching at the very end of your piece). Doing this prevents the fabric from being pushed down into the bobbin case by the needle. Make sure you have a 3”-4” tail of both bobbin and upper threads to hold onto behind the presser foot. While holding onto the thread tails, release the presser foot and hand crank the needle to the down position. Do not back stitch. 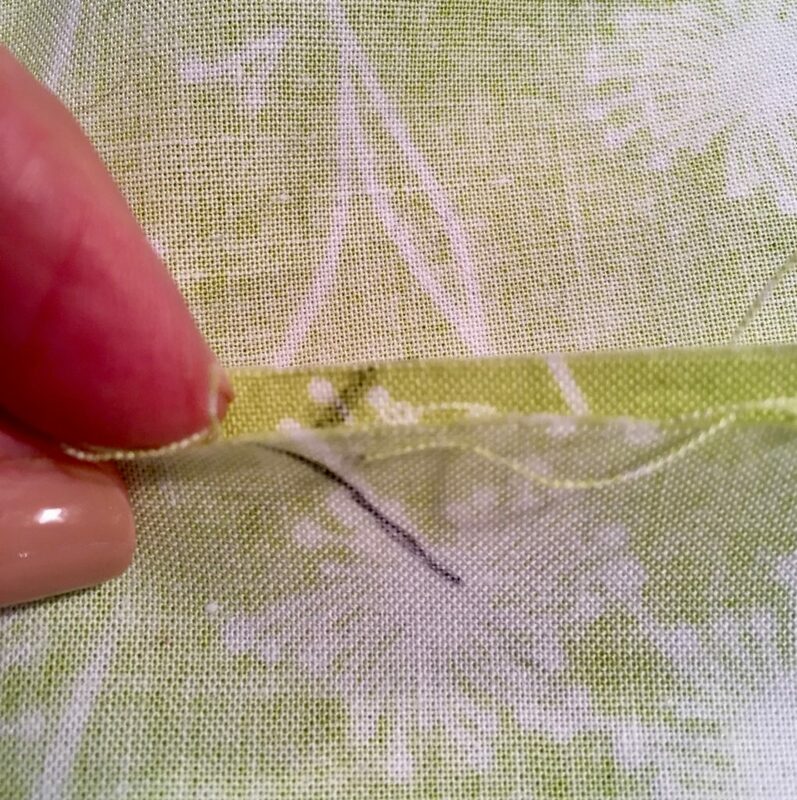 Hold onto the threads while you sew until you are able to hold onto the stitched line instead. 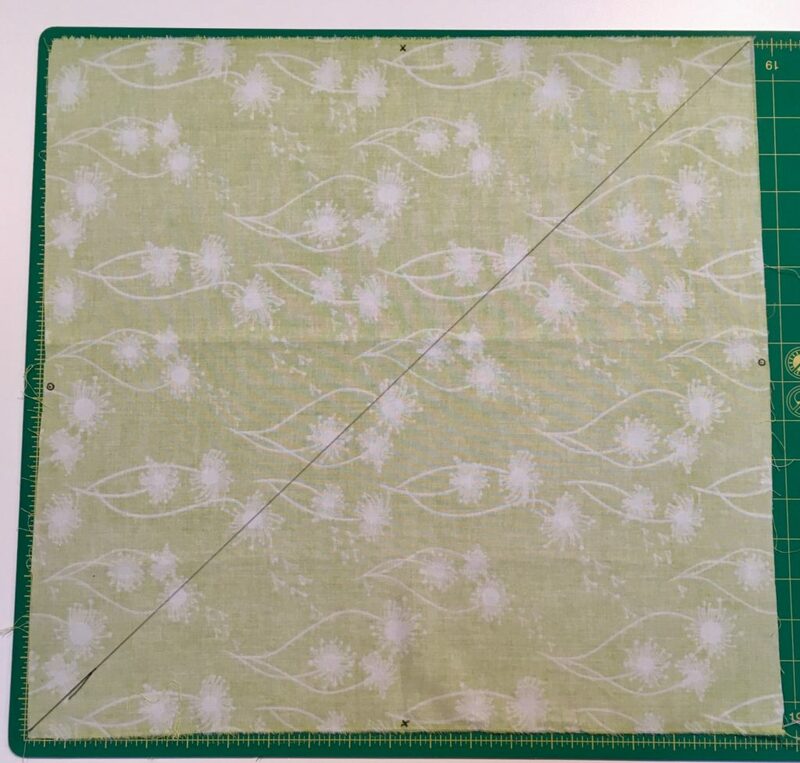 Hold onto the stitching line the entire time you are sewing. This keeps even tension and also helps you steer the fabric in a very straight, controlled line. 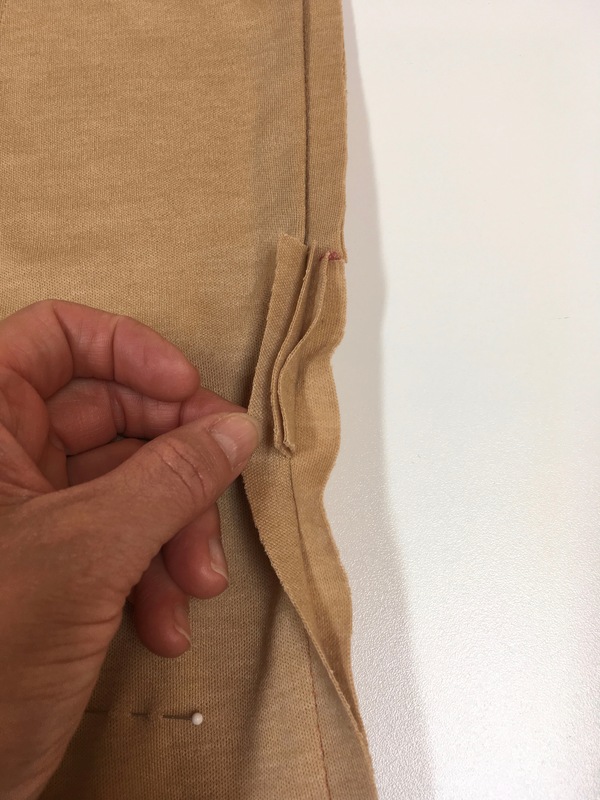 Continue stitching a straight line 3/8” from the hem, proceeding slowly and cautiously until you reach a speed that is comfortable for you. 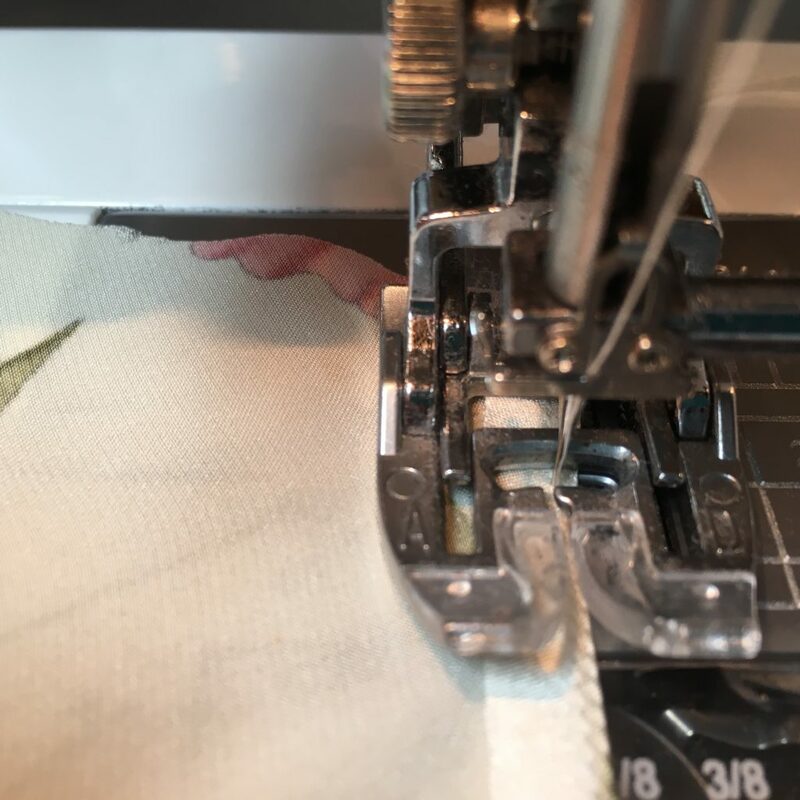 Once you reach the end, pull the piece out from under the presser foot leaving a 3”-4” thread tail on both the piece and the machine. 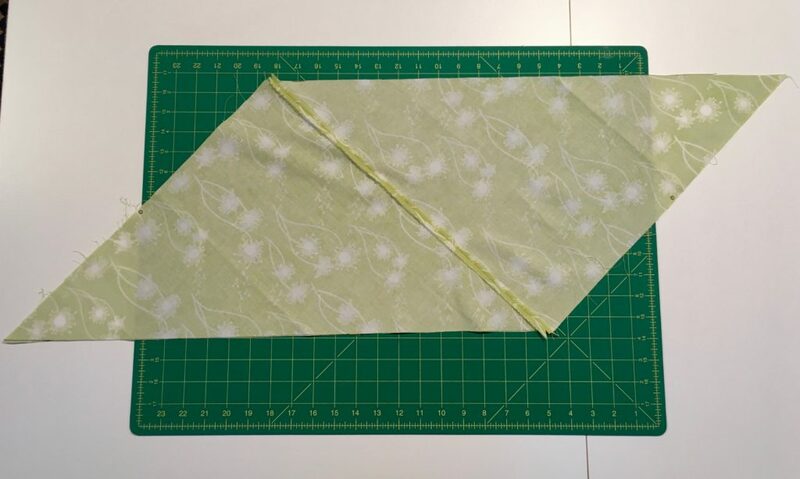 Fold the hem edge along the 3/8” stitching line to the wrong side and press in place (the stitched line should appear just barely along the folded edge on the wrong side). 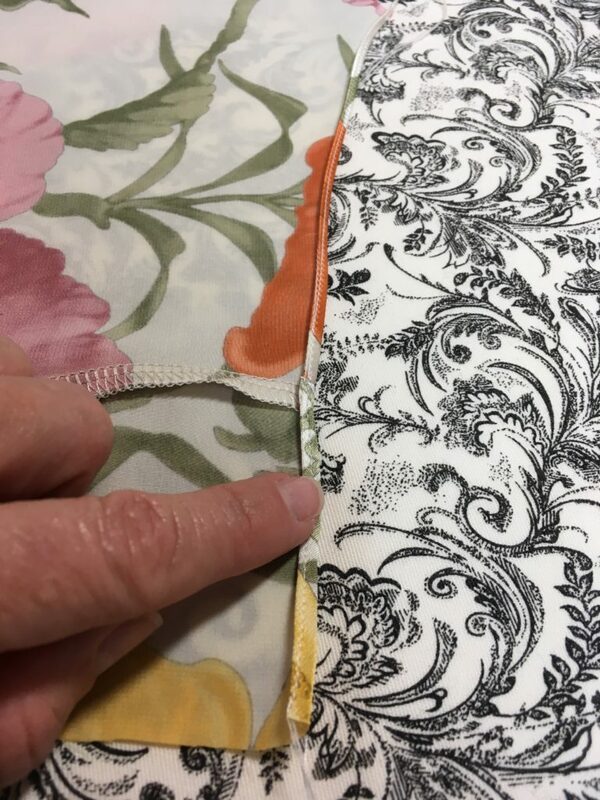 Place the folded hem edge under the presser foot so that the needle pierces the fabric 1/4” from the leading edge and as close to the fold as possible. 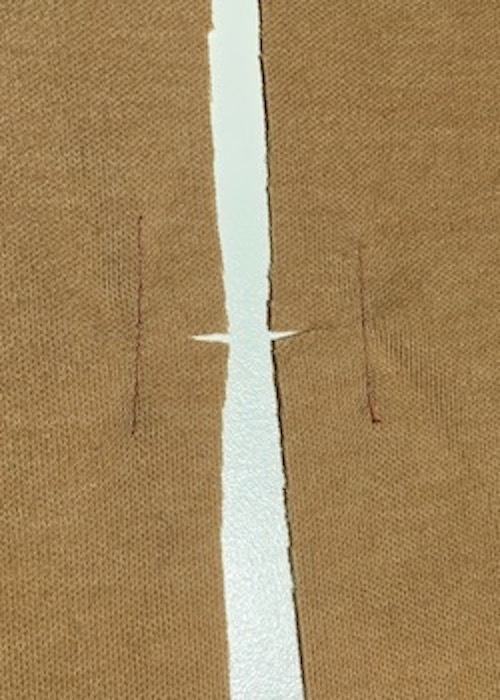 Begin sewing again as you did in steps 8 & 9, only this time stitch very close to the folded edge (not 3/8”). 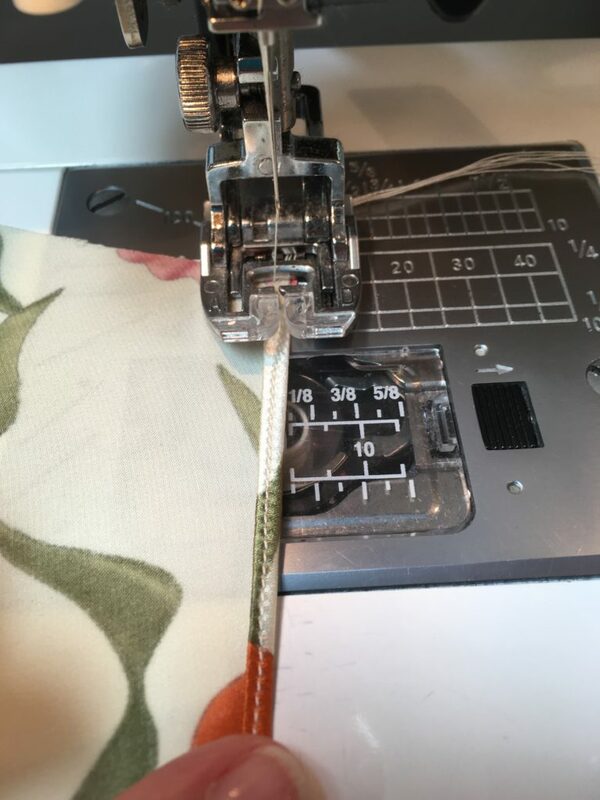 If you get off the edge while sewing, stop immediately, lift the presser foot and carefully (without pulling out more thread from the bobbin) reposition the fabric edge and restart where you went off. Do not cut the thread; just keep going. When you reach the end of the stitching line, leave thread tails as you did earlier in step 9. 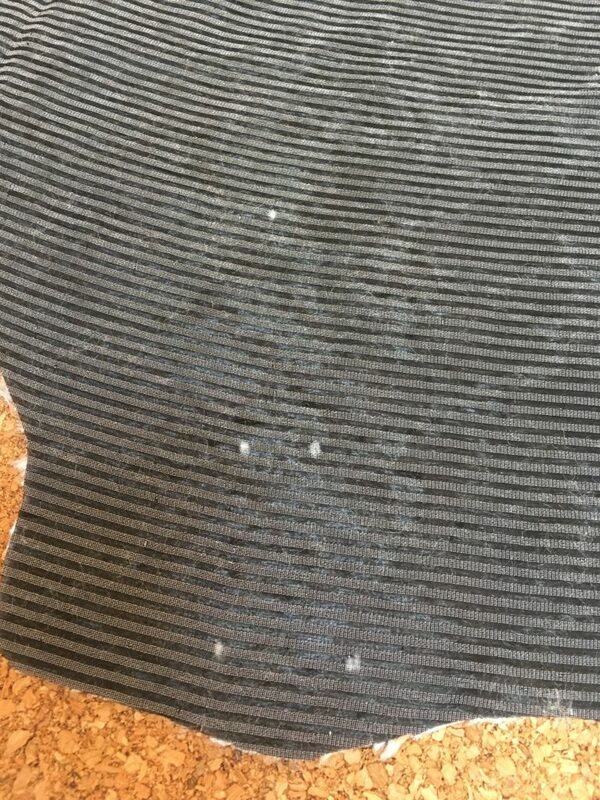 Press the stitching in place and then trim off the excess very close to the second stitching line. Use appliqué scissors if you have them. Be very careful not to cut through to the front of the piece. 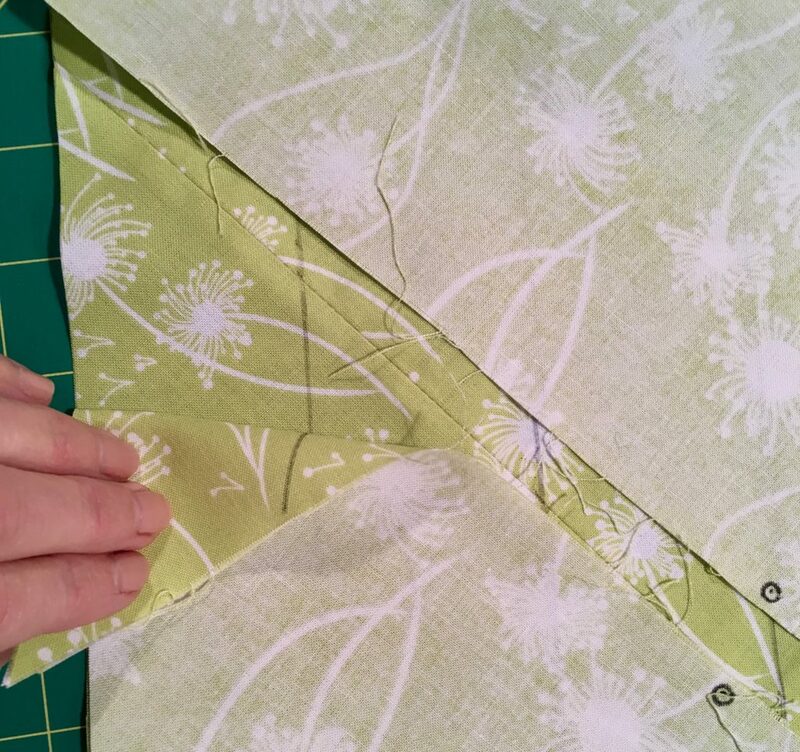 Fold trimmed edge over along stitching line to wrong side and press. Position the newly folded edge under the presser foot again, 1/4” from the leading edge and so the needle will just pierce the hem edge of the fold. Hold onto the tails as in previous steps and stitch the entire length one last time. 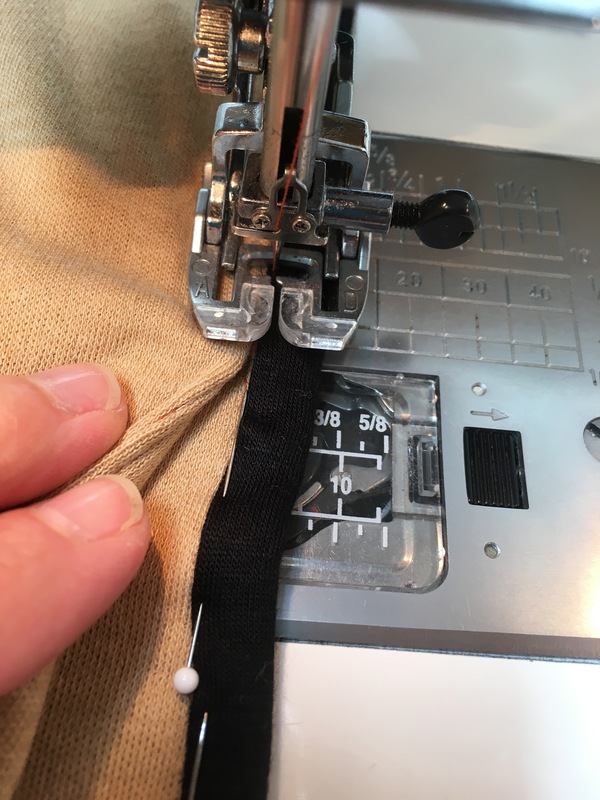 Remove the piece from the machine and trim all thread tails. Press the hem in place. That’s all there is to it!! 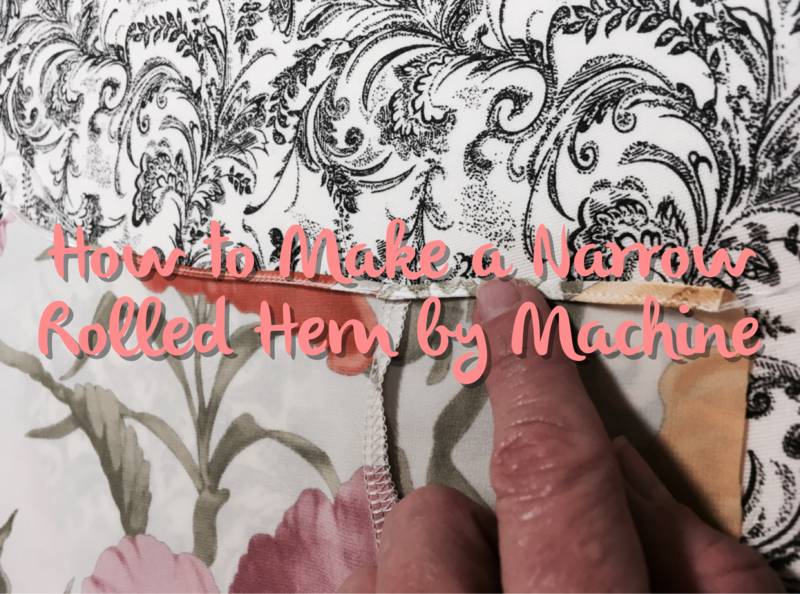 I hope you have enjoyed this tutorial on how to make a very narrow rolled hem by machine. 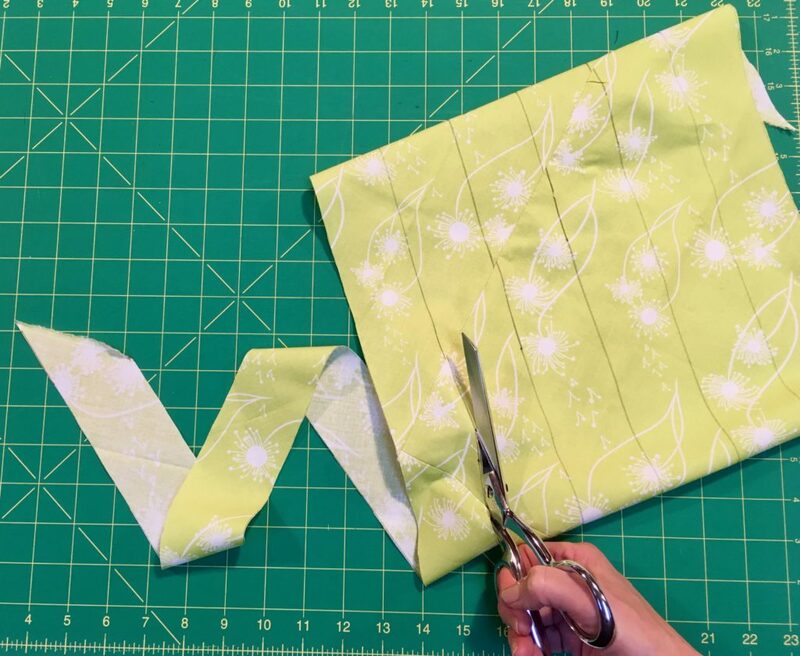 This technique is useful for many other sewing projects such as finishing the edges of scarves, skirts, dresses and blouses. 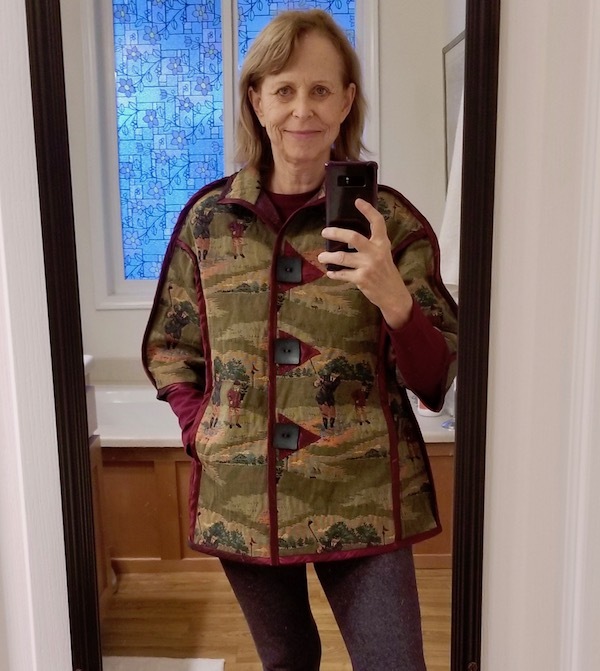 I do hope you give it a try on the new Tammy Top, and when you do, please remember to send us images of your work, or post them on Instagram using #ZZDTammyTop. We would love the opportunity to share what you’ve done on our social media. And, if you haven’t purchased Tammy yet, you can do so at my Etsy shop. Stay tuned for part two, the narrow serged hem, coming soon! 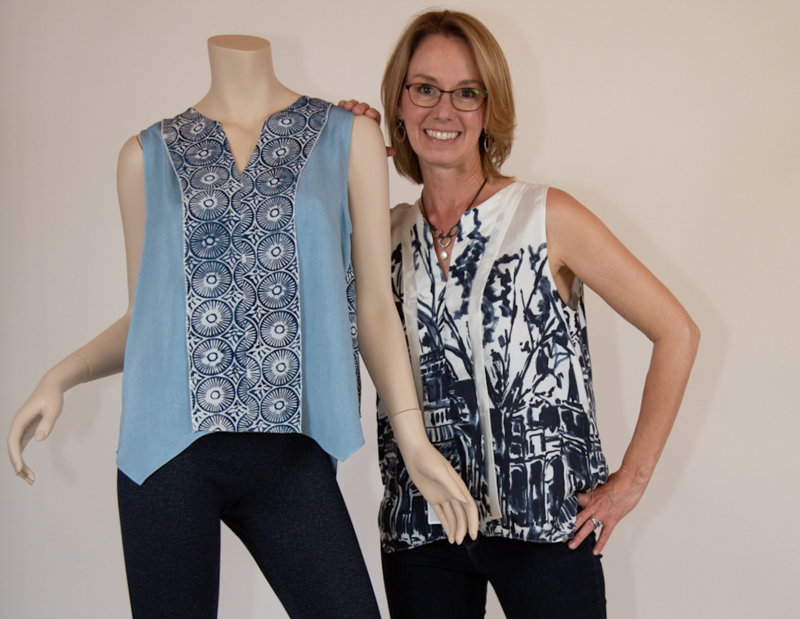 I am so excited to share that the Tammy Top has arrived just in time for your summer sewing! Like Rosita, Tammy is named after a real person, a dear friend of mine who I make sure to meet up with once a month. Tammy is beautiful and brilliant. She takes excellent care of herself physically and nutritionally, and practices yoga and meditation daily. She is a breath of fresh air to everyone, as she listens intently to every word as a Life and Wellness Coach. Her kind advice and support leaves everyone feeling lighter and ready to face the world head on. So, how could I not name this sleeveless, breezy top after her? Tammy is designed after a top I have loved and owned for many years. In fact, I have been making them for myself for the last three years now! She is my ‘go to’ summer blouse, just like Rosita is my ‘go to’ winter jacket. 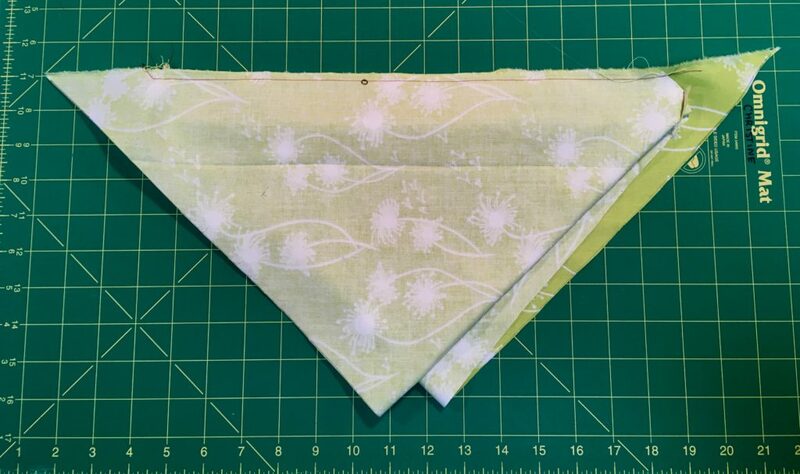 I most often make my Tammys out of silk, as I prefer the lightweight float of chiffons, but she is just as fun when made out of lightweight cottons and rayons, and those fabrics are easier to sew. 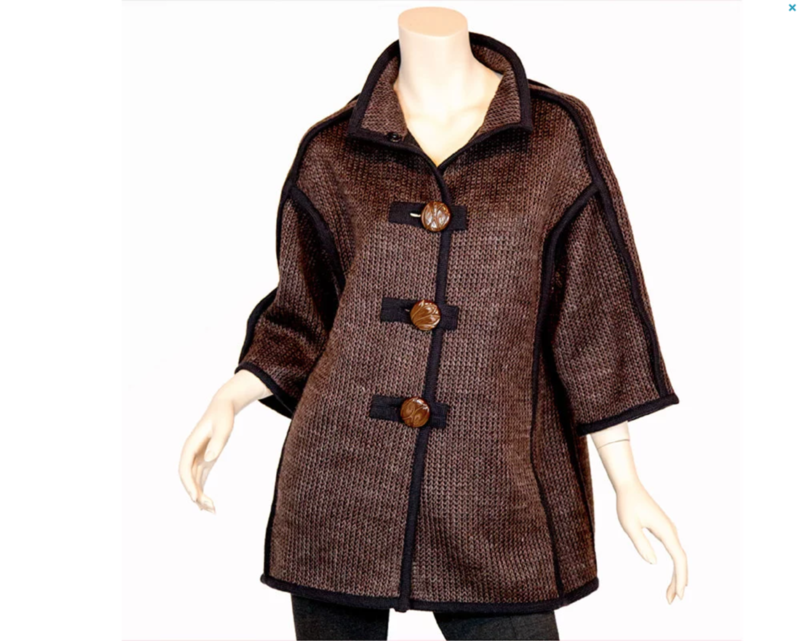 She looks great assembled in one single fabric, or with contrast as shown on the pattern cover page. Tammy is easy going, designed to simply pull on and off over your head. She has a loose fit with an overall ‘A’ line shape, is multi-layered with a high/low hem, and features a stylish, flat front flounce. 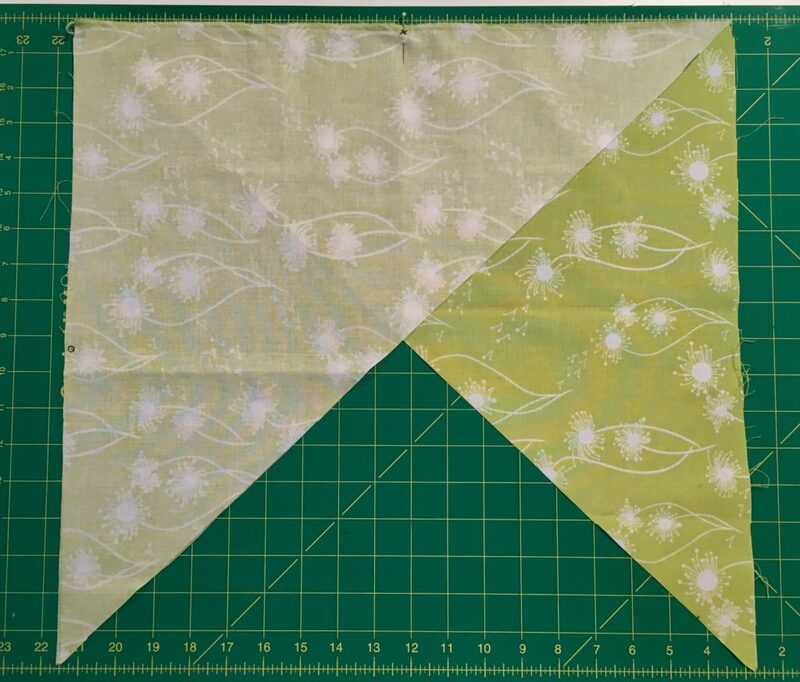 You will also find a hidden princess seam in the front, underneath the flounce. The upper back flounce features a 2” box pleat for extra swing and added walk-away fashion. We hope you give Tammy a try this summer! We know you will enjoy adding her to your collection. You can purchase her at my Etsy store. If you’d like to see more Tammy Tops, you can do so here. Please share this message with your friends and stay tuned! Tips and tricks are coming soon for both the Rosita and Tammy. Happy Summer and Happy Sewing!! Here at ZigZag Designs, we like to take the focus off of your body and into the garment. 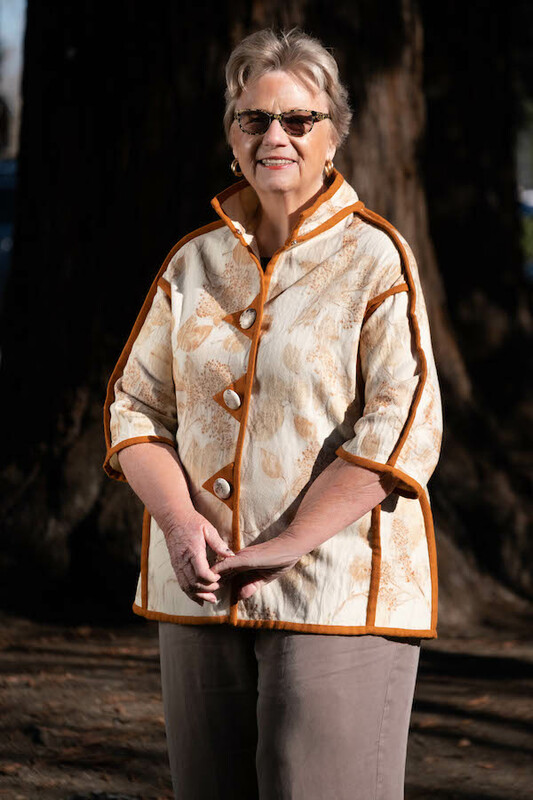 Our designer, Christine Groom, believes everyone deserves to wear great fitting garments and so she chooses to focus on the garment’s measurements rather then your own. Her reasoning is that each individual has a “preferred fit”. Imagine the basic t-shirt, some like to wear them close and form fitting, some a skim, barely-touching-the-skin fit, while others prefer a loose, off-the-body fit. This difference is called “ease”. “Ease” is the amount of space between you and the garment. The amount of ease preferred in a garment varies from person to person. But don’t let our design goals be your rule. 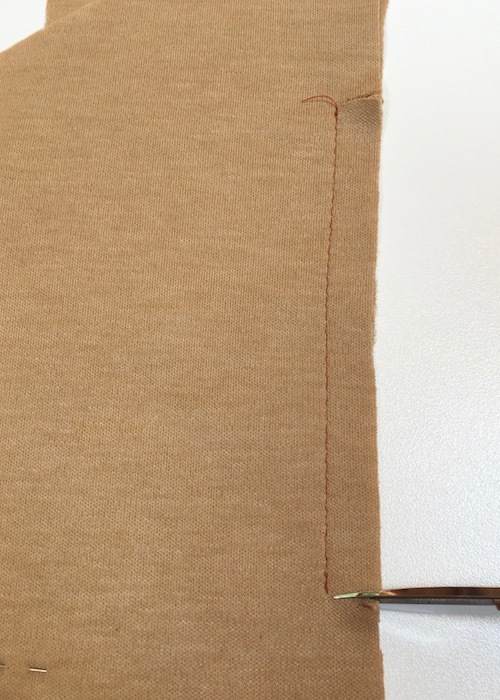 On each pattern’s package, the finished garment’s measurements will be listed by size. 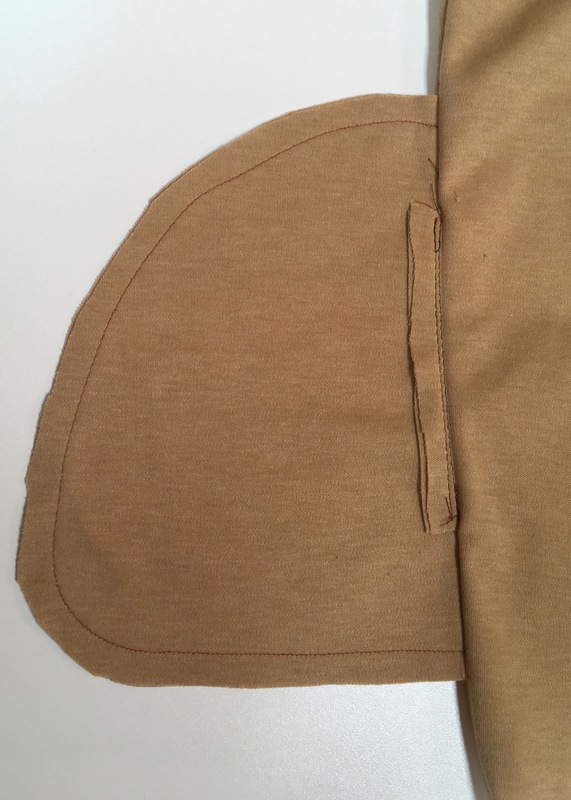 These measurements are the actual interior dimensions of the garment. The best way to decide what size will work for you is to pull something from your closet that you love to wear because of the fit. 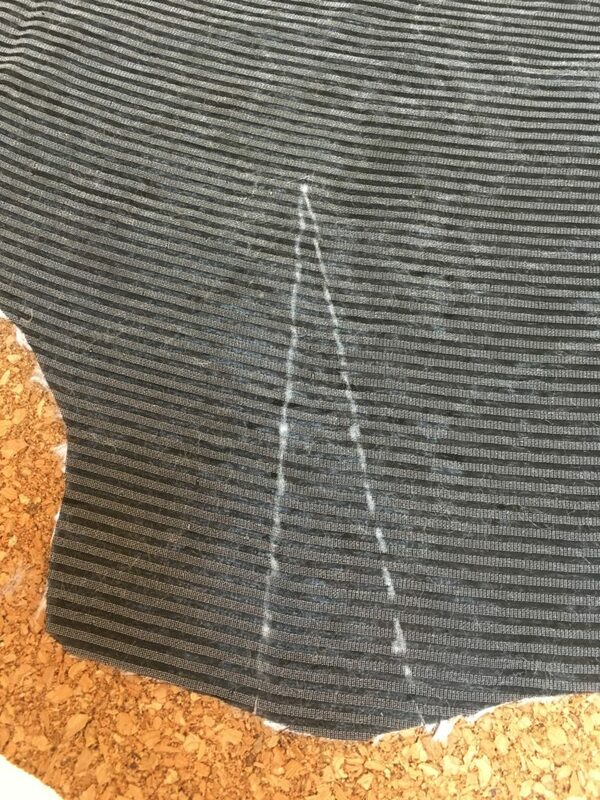 Then, measure that garment’s interior dimensions and compare them to the ZigZag garment’s measurement chart. Another item to consider is the fabric you will be using. If you select a thick, bulky or otherwise firm-handed fabric, you may want to size up for more ease of wear. If you choose to use a lightweight woven, knit or float-y fabric, you may want to use your normal size, or even one size down. A perfect example of this is the Rosita Jacket. Christine wears both the X-Small and the Small. She makes her choice based the fabric and the amount of extra swing she wants in the finished garment. 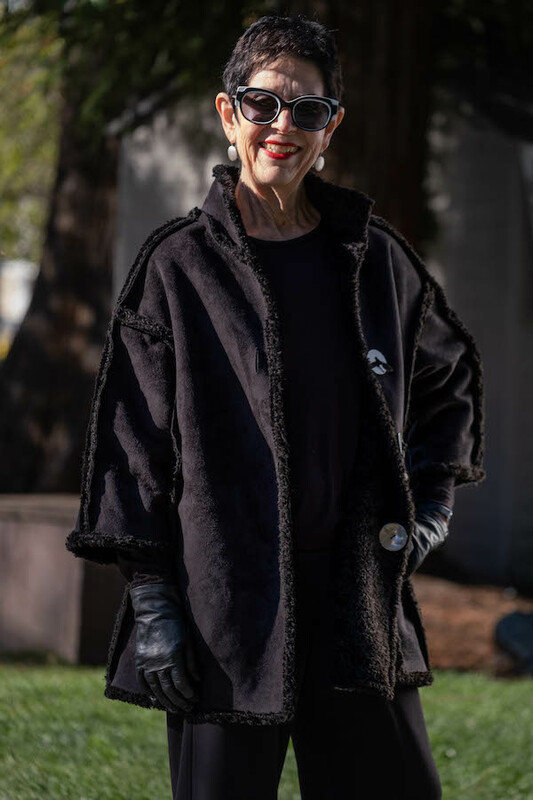 Lastly, it is important to keep in mind that most independent designers design garments that look best on them, so it’s important to know what the designers look like! For example, Christine’s body is a typical triangle, small around the bust with around an A/B cup, and fuller and curvier through the hips. An example of a triangle body type is shown below. If you were to hold a ruler next to your body, it would lean in toward the armpit from the hips, making a triangle. 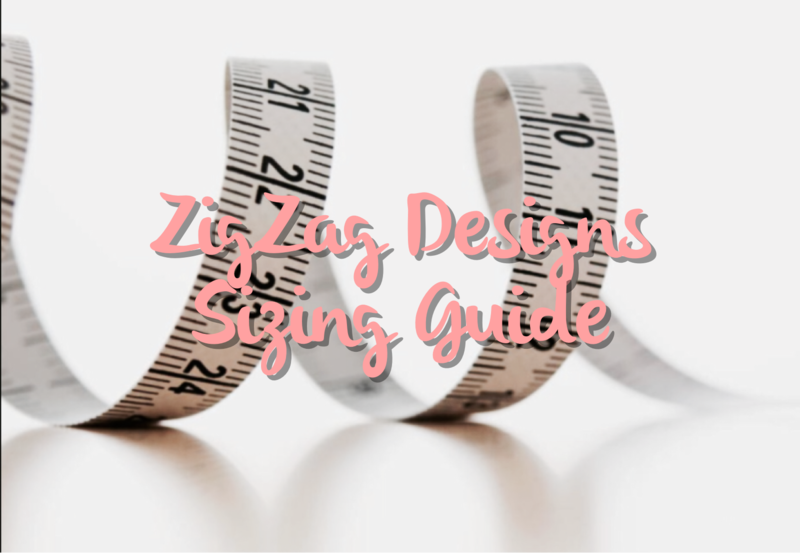 We hope you find these tips helpful when choosing what size to make your ZigZag garments!